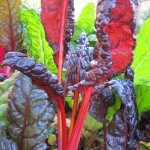 I planted several varieties of beets in my garden including, “Golden, Early Wonder, Flat of Egypt and Chioggio.” They range from the lovely pale anemic beet, “Albino”, to the “Bull’s Blood” beet that bleeds a healthy iron red from the moment I cut the stems in the garden. 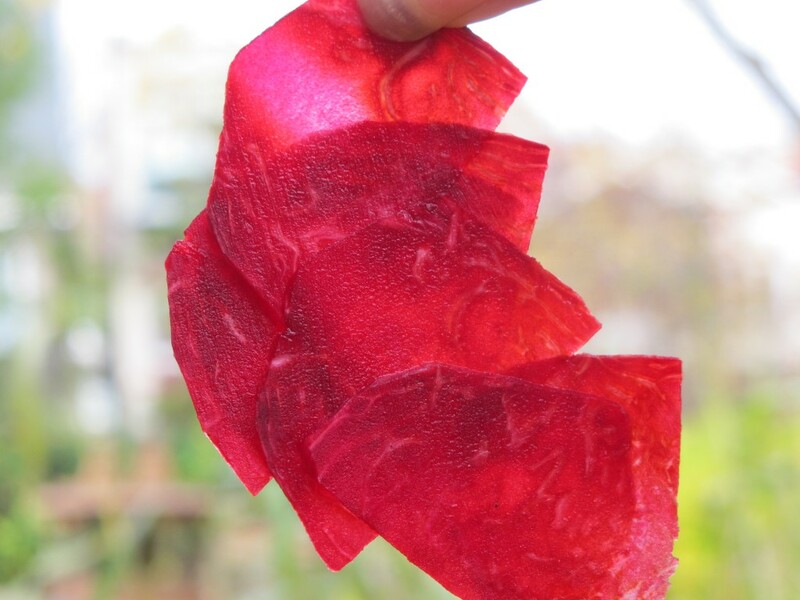 The first preparation I tried, after digging the “Bull’s Blood” beets from my garden; washing , destemming, and peeling a few, was thinly slicing the raw beets with a mandolin. Holding them up to the light they resembled bunderfleisch [dried beef] or beef carpaccio [Italian thinly sliced beef appetizer] I decided to make a Beet Carpaccio. It couldn’t be easier. Arrange the mandolined raw beet slices on an individual serving plate. Pour a little balsamic vinegar and olive oil on top. It will form a little pool on the bottom of the plate looking like “beef jus”. Sprinkle with a little salt and freshly ground pepper to taste. 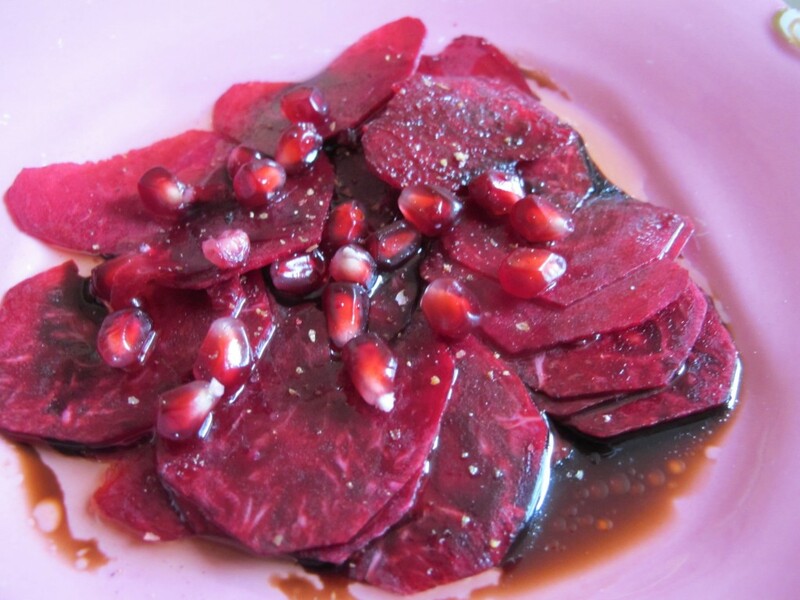 Traditionally, beef carpaccio is served with shaved Parmesan on top but I thought visually and tastewise, fresh pomegranite seeds would work better. 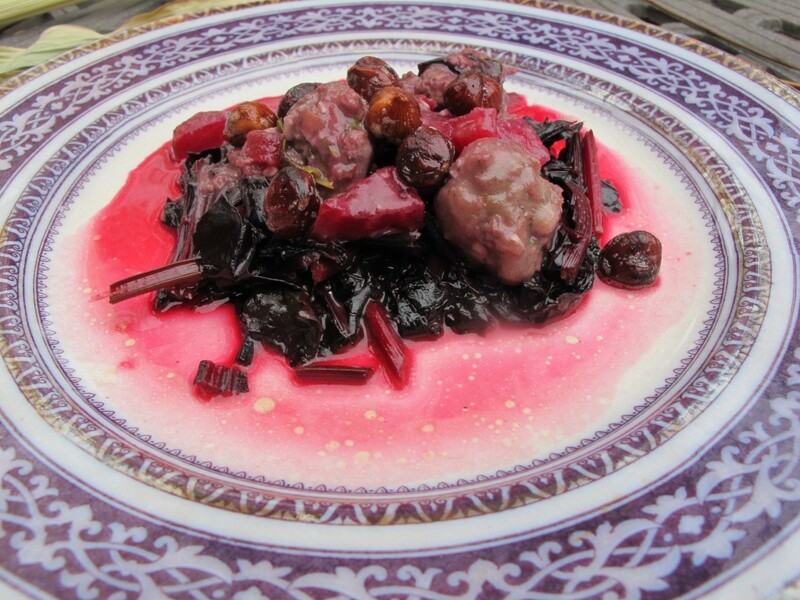 The vinegar will slightly “cook” the beets giving you an intriguing texture and taste between raw and cooked. 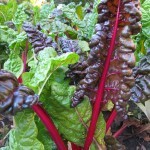 After the ersatz beef beet dish, the next ”Bull’s Blood” beet preparation needed some real, and more faux bull’s blood. For the real, little beef meatball’s and for the false, a Hungarian wine, “Egri Bikaver”, translating as bull’s blood, would inspire this recipe. 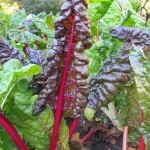 For this and the following recipe, scrub the beets and cut off the stems and tops, reserving them for later. Bake the beets in the oven until a knife pierces them easily. Cool and peel. 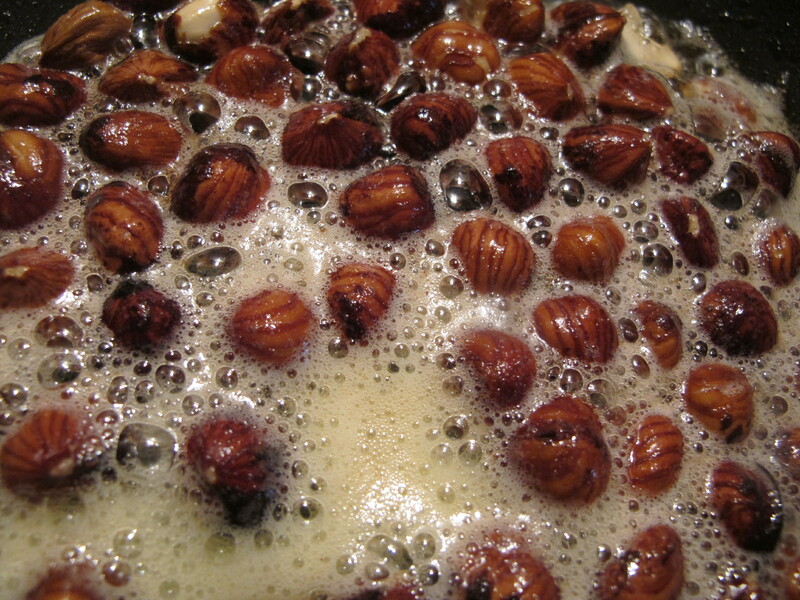 Saute hazelnuts in butter until slightly browned. Cool. Roughly chop 1 tablespoon of the nuts for the meatballs and set the rest aside for the final dish. Prepare the meatballs by mixing 1/2 lb. ground beef, 1/2 cup bread soaked in water and squeezed of excess liquid, 1 tablespoon chopped hazelnuts, chopped mint and thyme to taste. Form small meatballs, about an inch in diameter, from the mixture and roll them a little flour. Set aside until ready to assemble the dish. 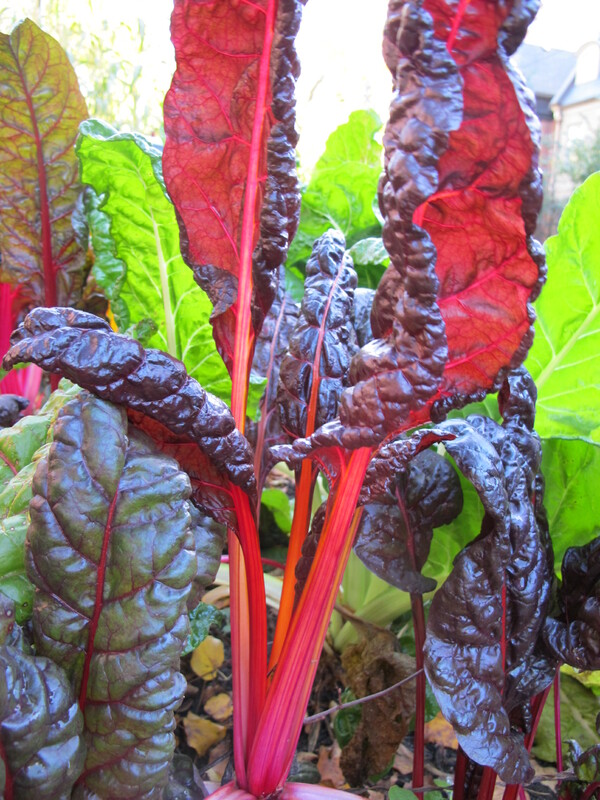 Cut the reserved beet tops and stems into ribbons width-wise.. Usually they would be called beet greens, but these tops are burgundy red. Saute them in a mixture of butter and olive oil until softened. Put them aside while you cook the meatballs. Heat some olive oil in a pan and add the floured meatballs. Saute until browned. Start adding the red wine until you have a pleasant textured sauce and the alcohol has evaporated. Add chopped fresh mint and thyme to taste. Cube some beets. Add to sauce and simmer with the meatballs in the sauce. Reheat the beet tops and when hot, drizzle with honey. 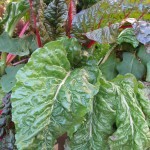 Place the warm greens on individual serving plates. 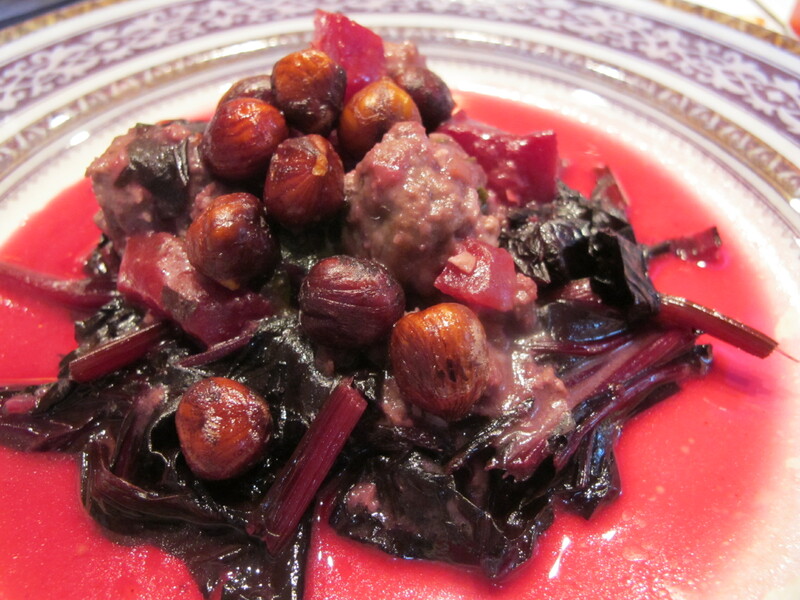 Add some whole sauteed hazelnuts to the meatball, beet and sauce mixture. 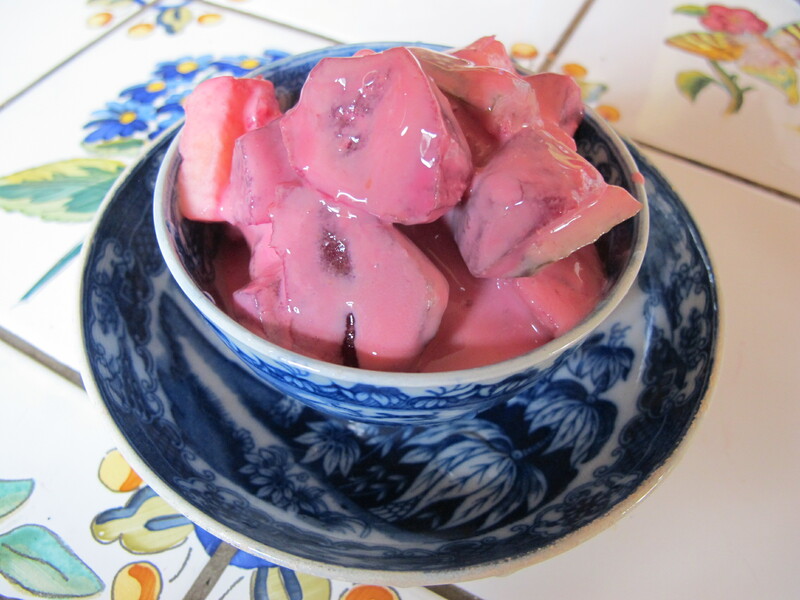 Put a portion over each plate of beet tops and serve. For the final beet recipe, cube the rest of the baked beets. Make a sauce of 1 cup light sour cream, 4 teaspoons of sugar, and 3/4 of a teaspoon prepared mustard. Taste it to see if you have the right blend of sweet and pungent. If necessary balance the ingredients to taste. Add cubed beets, a cubed “Fuji” apple, and a cubed dill cucumber pickle, the pickle in slightly smaller cubes than the apples and beets. [The pickle should be of the brined type not a vinegared one.] Mix all the ingredients together until blended. Can be served right away or refrigerated for serving the same day. 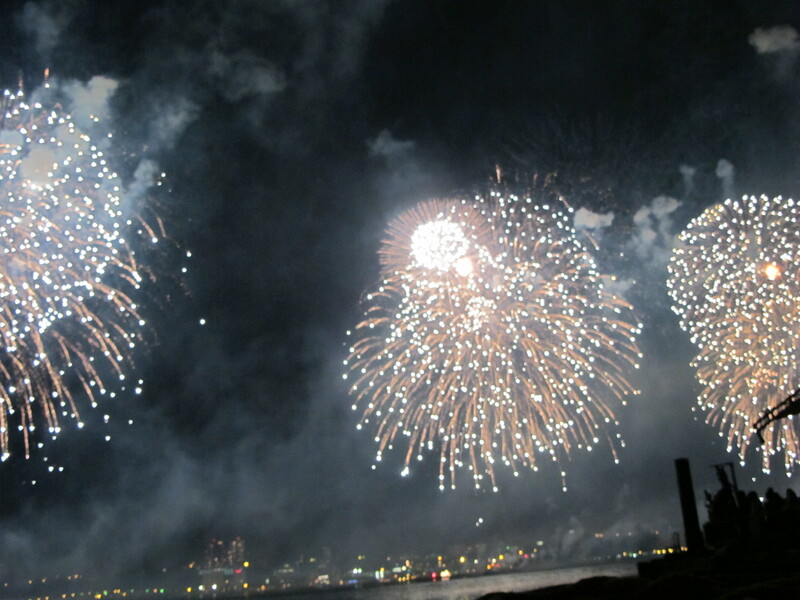 It was announced that for the first time in years the Macy’s Fourth of July fireworks were to displayed in the Hudson River. The last time I had seen them over the Hudson, was in the year of my sixth grade graduation. I had to go. We arrived in New York to one of those glorious Summer dog days of humidity and 104 degree weather. Luckily, we got seats to the display, on an historic tugboat, right in front of the three barges that let off the fireworks in triplicate. I grew up on Riverside Drive part of the Upper West Side of Manhattan. Our apartment had a view of the Hudson and I would spend countless hours sitting in the window watching the water, the boat traffic and the sun set over New Jersey. Watching the the fireworks at my childhood home at 137 Riverside Drive usually involved watching the display from my living room window. If we were really lucky, the super would let us go up on the roof and watch. 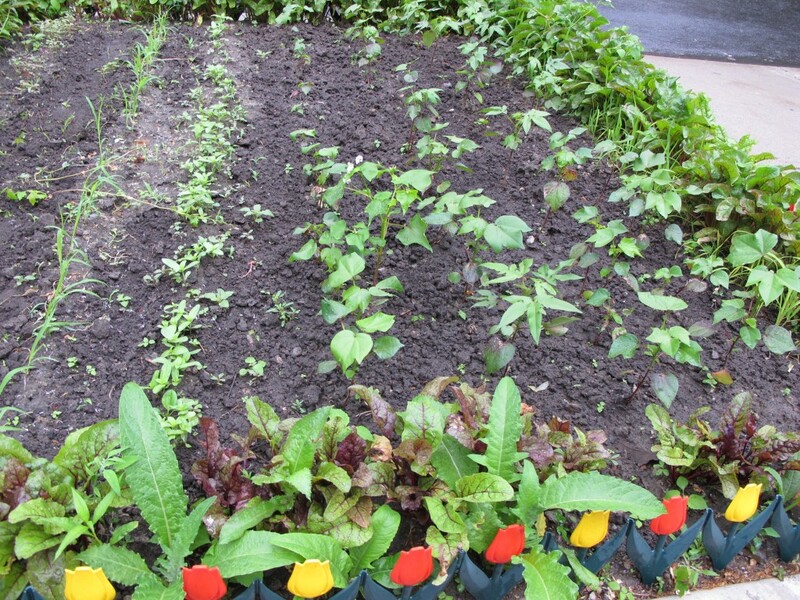 At about the same time as my 6th grade graduation and my last Circle Line cruise, I started my experimentation in “Urban Farming”. My bedroom window faced the inner courtyard of the building and was not particularly sunny but the window was large and faced south. It was there, I nurtured string beans and marigolds from seed to maturity and in the process won the science fair and became a pioneer in Urban Farming! In my viewless bedroom, that rooftop of the apartment building held curious sway. Forbidden; except when the super let us up. Mysterious; we looked for the traces of the legendary swimming pool in the gravel. 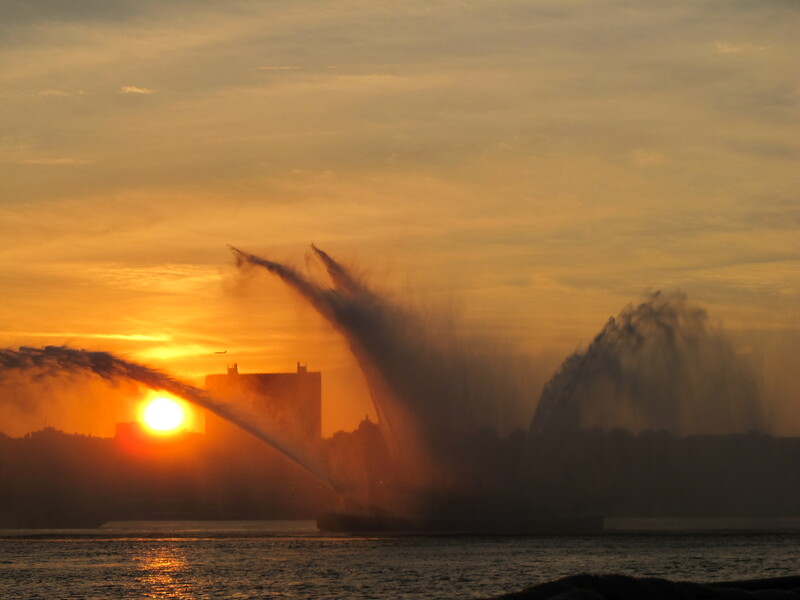 Unbridled; it had an unobscured view of the Hudson and basked in unshadowed sun. It stayed in my imagination until adulthood and my move to Toronto. 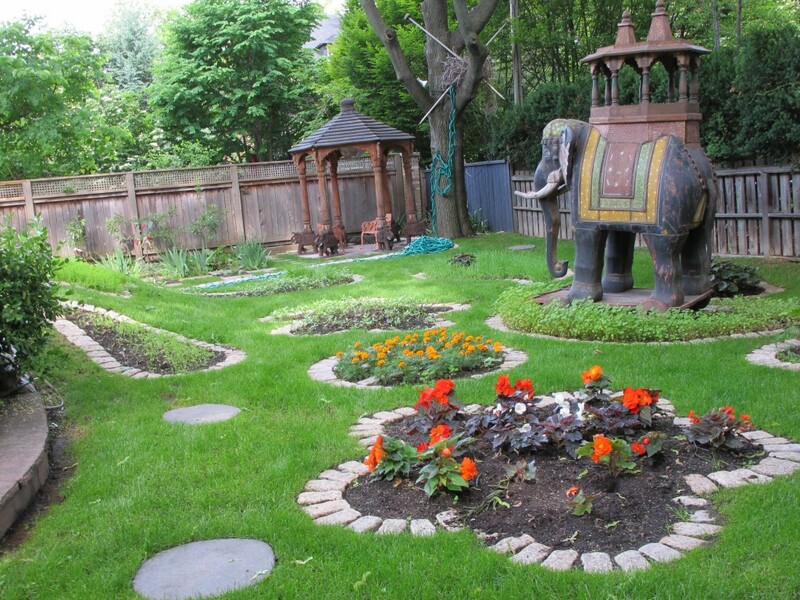 When I moved to Toronto and married, we bought a house and I had a plot of land to garden and farm in earnest. After a lifetime of apartment living, it felt good to be connected to the earth. 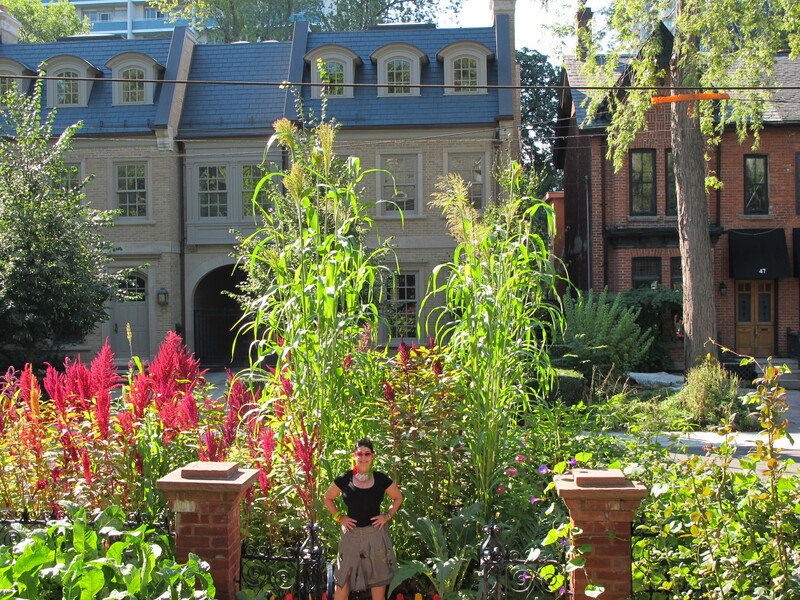 For 35 years I have gardened and farmed in three different houses in Toronto, gaining experience in horticulture, by planting and observing. 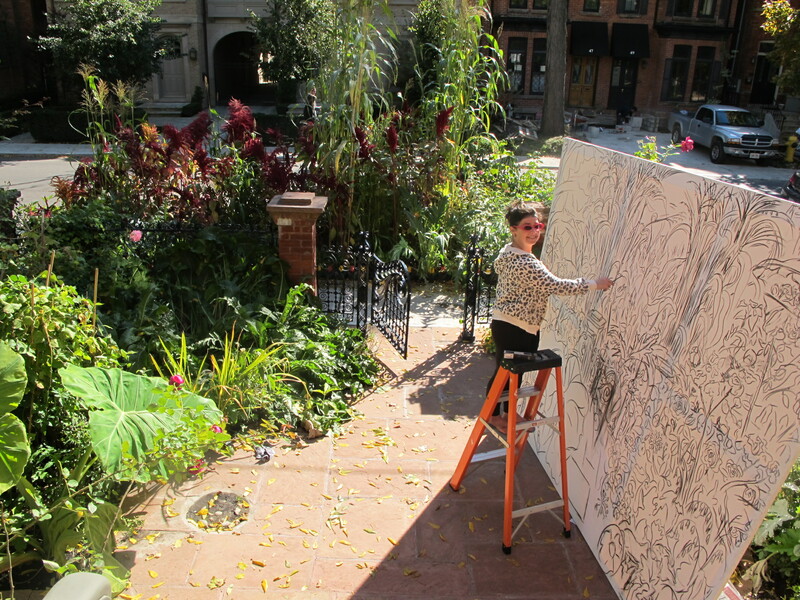 As an artist who loves sunlight, I never had any talent or desire for a shade garden. 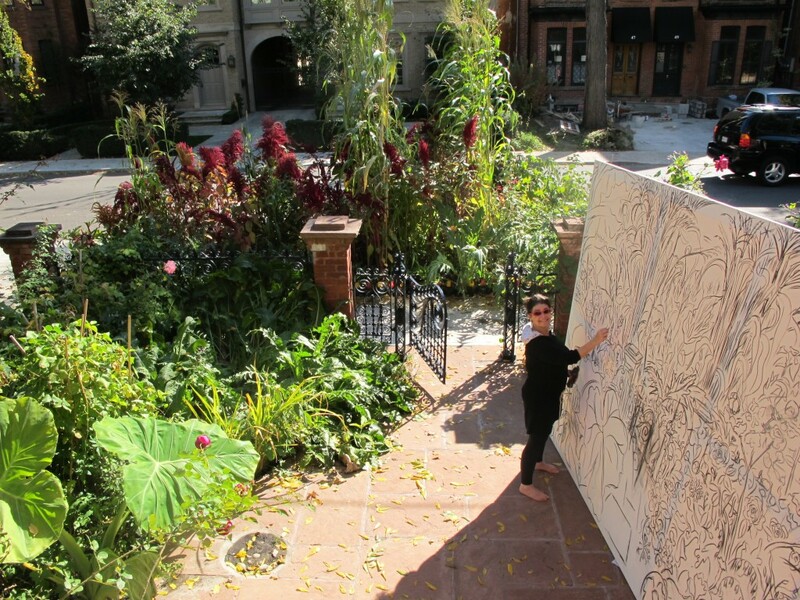 This, is the challenge for urban gardening. Trees, roots, shadows from one’s own house, surrounding buildings, there isn’t just any where to have unobstructed open space. As you trim trees, they grow taller and become impossible to prune. Buildings ever higher, begin to compete with the daylight. In the Spring of 2009 , I had a revelation. I had tried to grow tomatoes for years on the terrace adjacent to my kitchen. 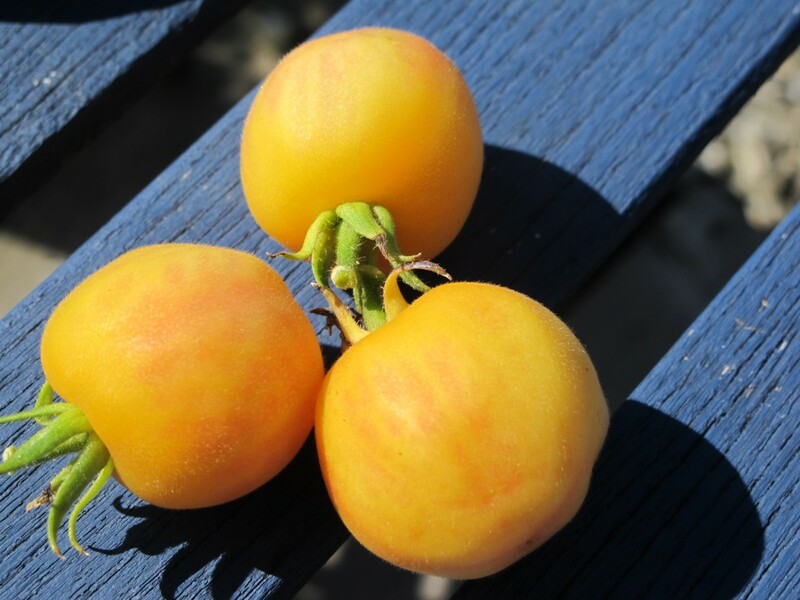 I grew them year after year with a modicum of success but as the variety of tomato seeds and plants available expanded, the yearning for complete sunshine to grow them grew. I hardly ever put tomatoes in my more decorative edible gardens. 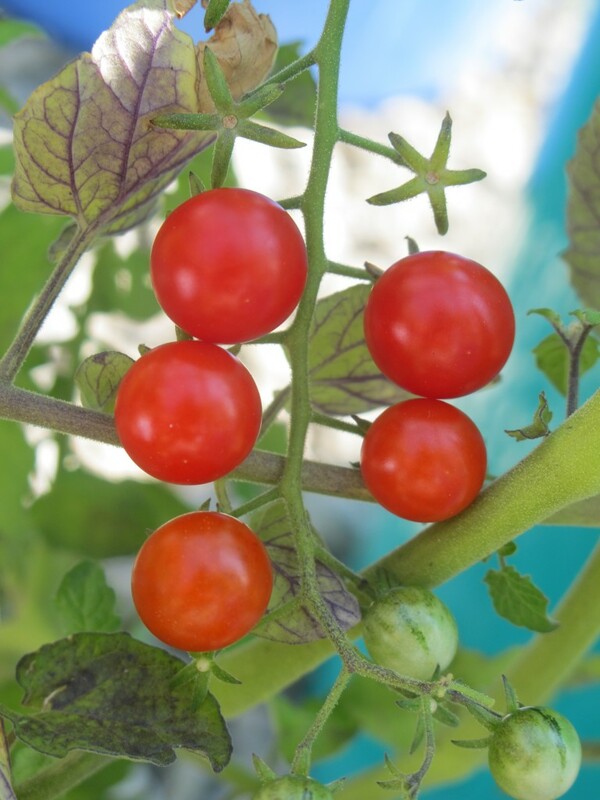 Tomato plants themselves, are not so beautiful but their fruits in their infinite colors, forms, tastes and sizes are as gorgeous as fertility goddesses. Back to the revelation. One March day, I was sitting in our top floor office in our family’s midtown Toronto office building www.124merton.com I ran out of the office and bounded up the stairs that led to the roof. I gingerly pulled open the door to see what there was. William Randolph Hearst never lived there, no fireworks were to be seen, no swimming pool to be traced, but it was mine! I could go up there whenever I wanted to. 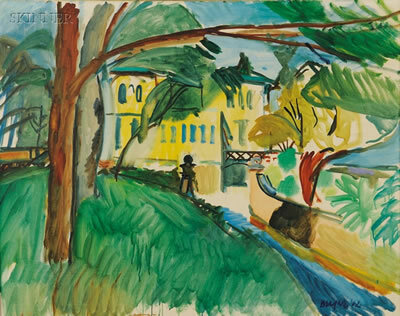 Instead of the inhospitable barrenness covered in gray gravel that I then saw, I imagined a verdant garden, an Edenic spot bearing tomatoes of every type, apple trees, and flowers. 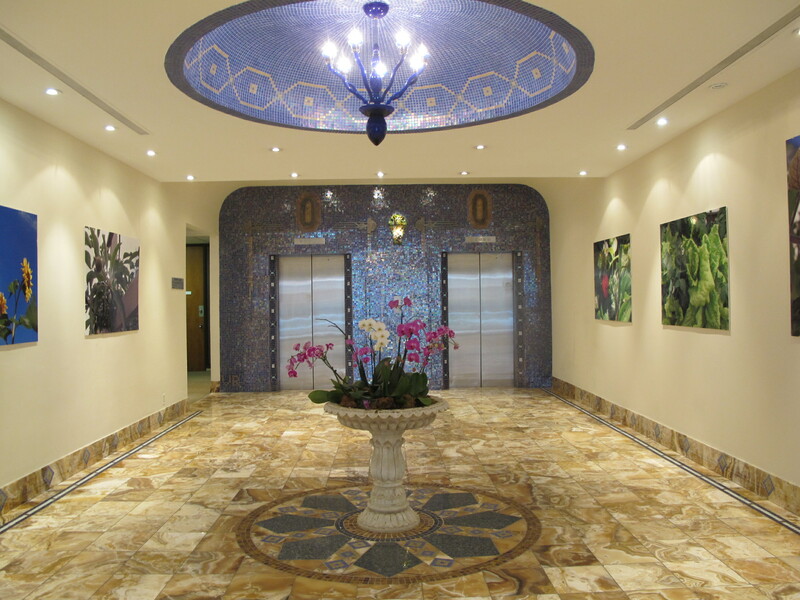 A place where people in the building could relax and soak in all the beauty. My roof garden was born. It was like dream I never knew I had or a seed that had laid dormant through adulthood. 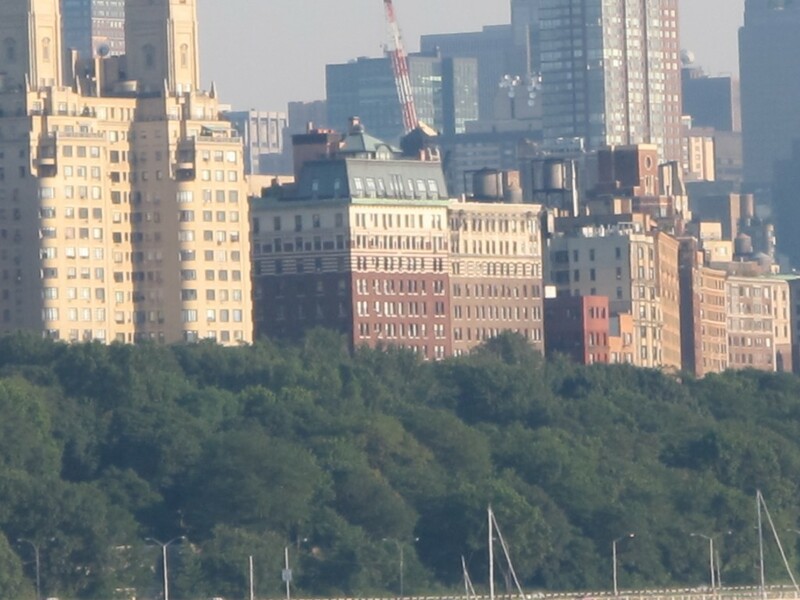 Forty five years had passed since I was last on my roof at 137 Riverside Drive in New York City, and more years since I had first observed that roof from the Circle Cruise Line, and grew those vegetables on my window sill. 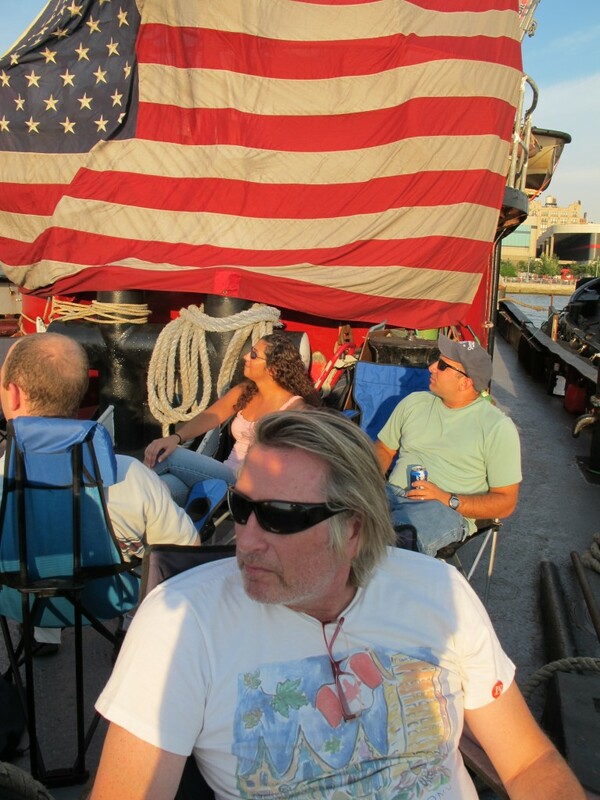 As I stood on the deck of the boat circumnavigating Manhattan ,this steamy July 5th, I realized what paradises, life had given me the opportunity to create. In a circular line, it all comes back. Addendum: This year on the roof garden, I planted and harvested 37 varieties of tomatoes, 4 of apples, in addition to lettuce, cucumbers, peas, beans, radishes, carrots, beets, hops, melons, basil, thyme, nasturtiums, marigolds, roses, onions, corn, mint, strawberries, and sunflowers. 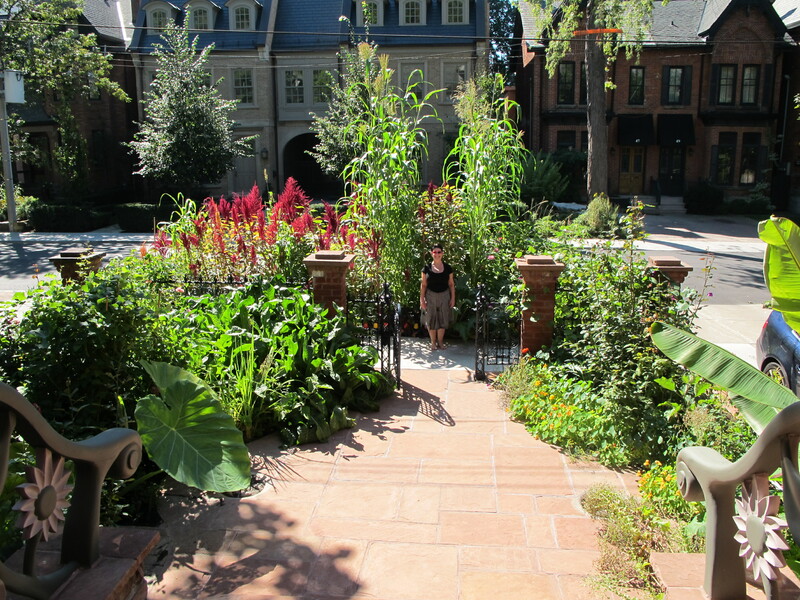 The garden appeared in publications and garden blogs internationally. 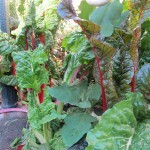 The garden and its produce were enjoyed by many. A photographic exhibition of it’s bounty, now adorns the lobby below it. this article appeared in the Culinary Chronicles Autumn 2010 Issue #66., the magazine of the Culinary Historians of Canada. The world price of cotton in October of 2009 was 66 cents per pound. By October of this year, the price of cotton had risen to $1.26 per pound.The price of cotton had risen dramatically in the past year and that was the price of your average cotton. 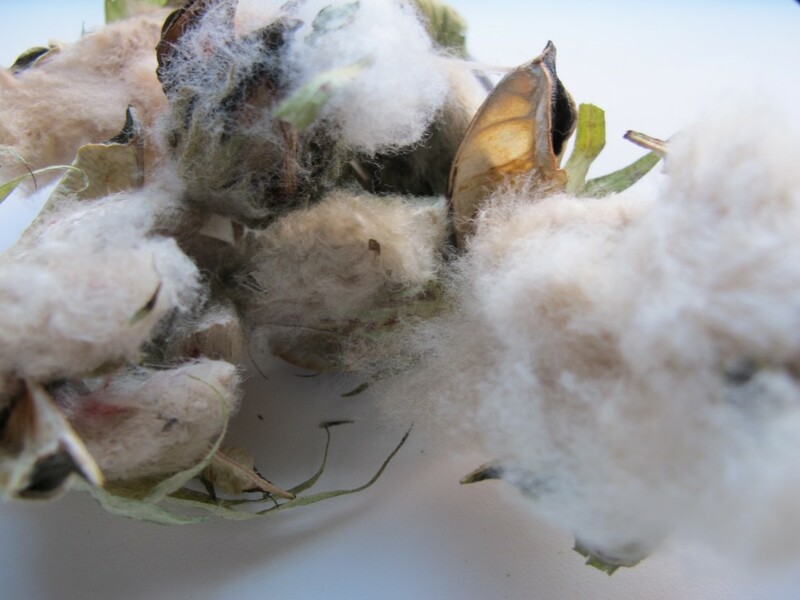 Who knows what price, organically grown, extremely rare Canadian cotton could fetch? How rare? Looking up the statistics of world cotton growing, Canada was ranked 73rd with 0% production of cotton! Single-handedly, if I produced cotton, I would push up Canada’s percentage of cotton production infinitely. November 3 rd was the first light frost in downtown Toronto. I decided that the cotton growing in my boulevard garden was not going to mature any further and I might as well pick the bolls. I gave myself a pep talk as I donned warm clothing to go out into the garden. 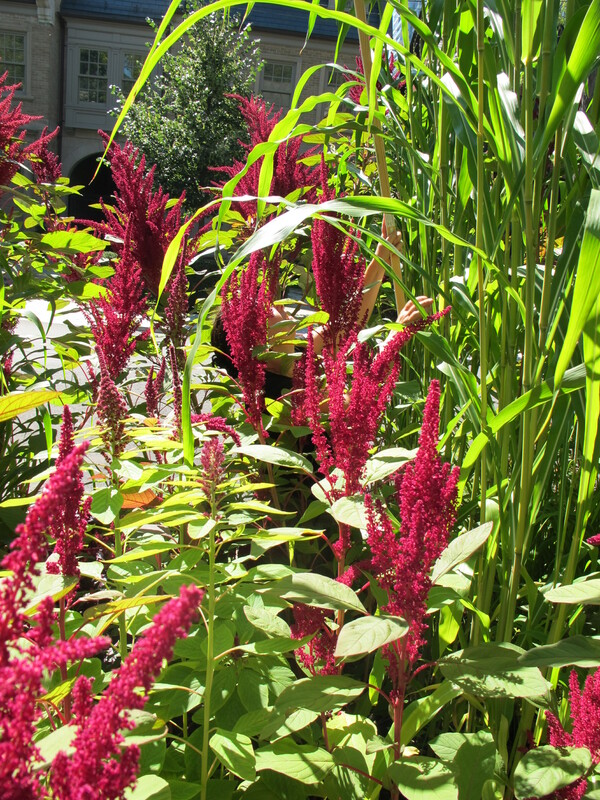 “ Well, I enjoyed growing the cotton from seed to boll and the beautiful cotton flowers and the delight and wonderment my planting had elicited from visitors to the garden. So what if I didn’t get any cotton, did it really matter?” Slightly dejected but holding my head up high, I headed out with a large basket and secateurs. As I snipped away I noticed something! The bolls had began to split and show their cottony interiors. I had succeeded in growing and producing cotton! I brought several large basketfull’s into the house. Within days they all began to split and expand showing their cottony interiors. Even more amazingly, just as the different varieties of seed packets had promised, I had cotton in natural shades of pink, brown, white and green. 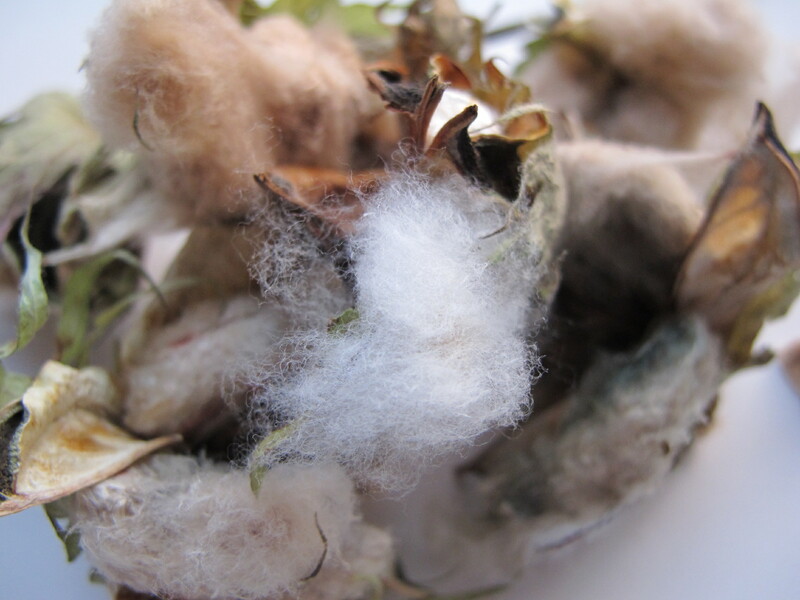 And encased in each quadrant of the fluff were seeds for next year’s cotton. 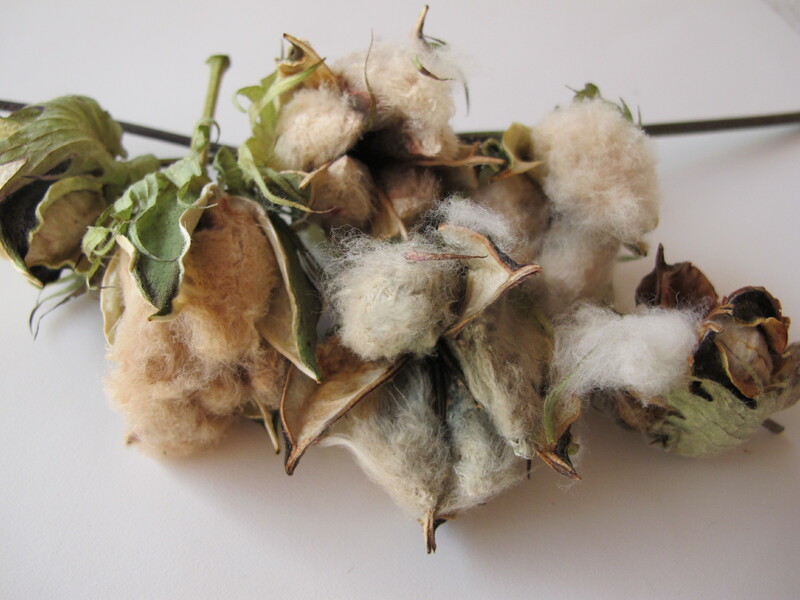 What to do with this precious cotton? I will soon announce an artist’s limited edition of cotton on my website www.vreiss.com . Today, there were snow showers. The time for picking tomatoes from the vine has passed for this year. 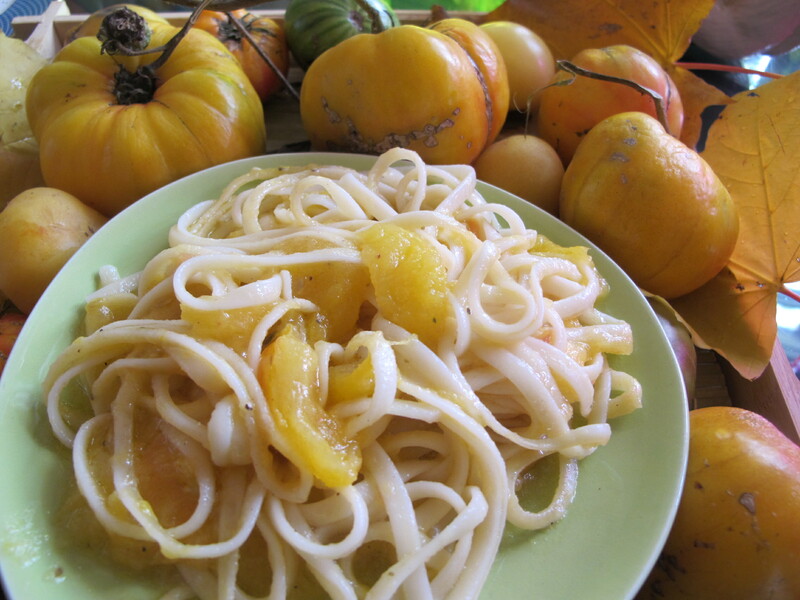 I used the yellow tomatoes that have been ripening on the table in my breakfast room for a quick pasta sauce. Plunge the tomatoes into boiling water. Remove the tomatoes with a slotted spoon and cool under cold running water. Peel and coarsely chop. In the meantime cook linguine. When the linguine is almost cooked, drain, retaining some cooking water in the pasta. Return to pan and toss the tomatoes into the pasta. While cooking on a medium flame, add salt and pepper to taste and olive oil to coat. Continue cooking until the tomatoes have formed a sauce and the pasta has cooked. Serve. 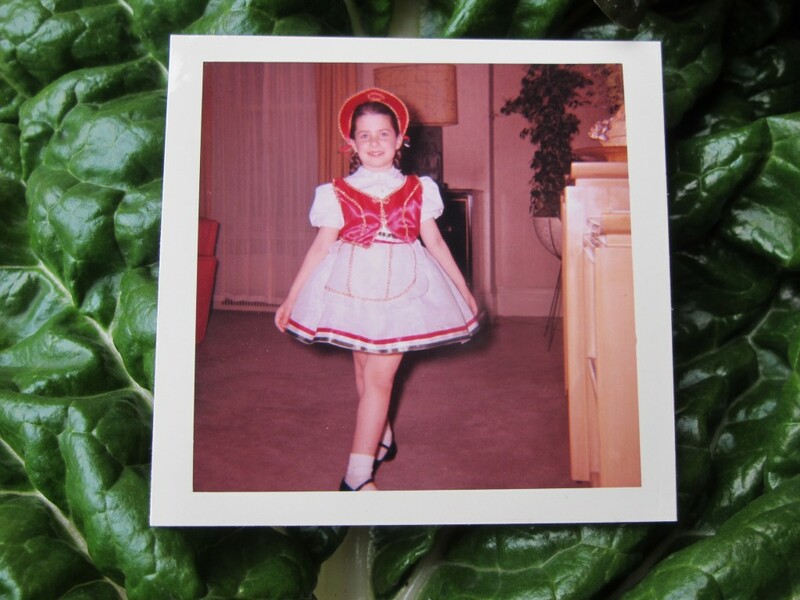 Csardas /ˈtʃaːrdaːʃ/: My Grandmother, would sew the costume and my Mother would teach me the dance. Which came first, the inn “Csarda” or the dance “Csardas”? That philosophical question was unimportant to Hungarian expats in New York. What was important, was to find where it was possible to replicate the food of the csarda along with the atmosphere of the great coffee houses of Budapest. To many New Yorker’s the answer was Mrs Terhes, a restaurant on the upper east side of Manhattan. 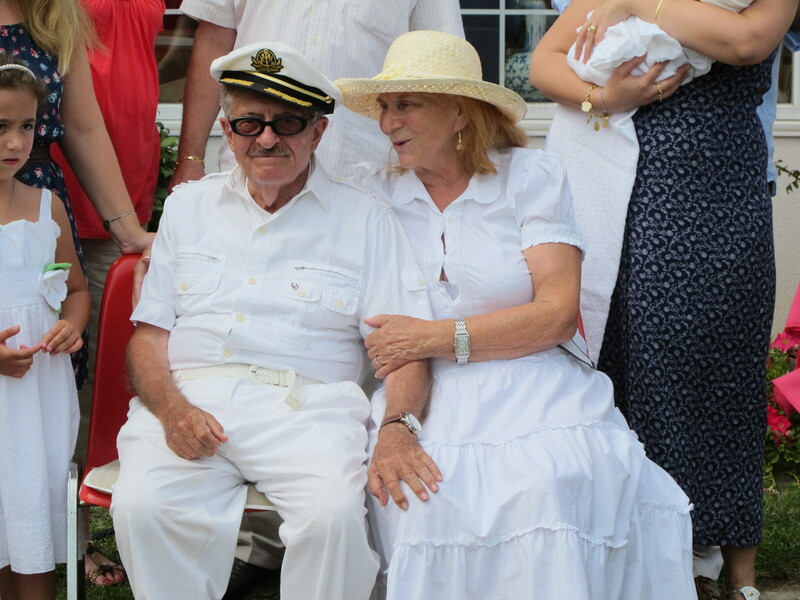 My Father, a good businessman to the core, had no nostalgia for a country that had first persecuted him as a Jew and then decided that his kind were anathema to the Communism. 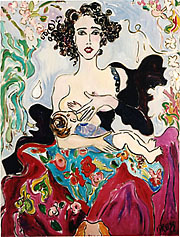 But Mother’s milk being Mother’s milk, his headlong rush to enjoy the freedom’s and the glories of New York was even greater when there were also Hungarian restaurants to enjoy. Mrs Terhes, was the place, and as a great treat my brother Rony and I would dine there with our Father. 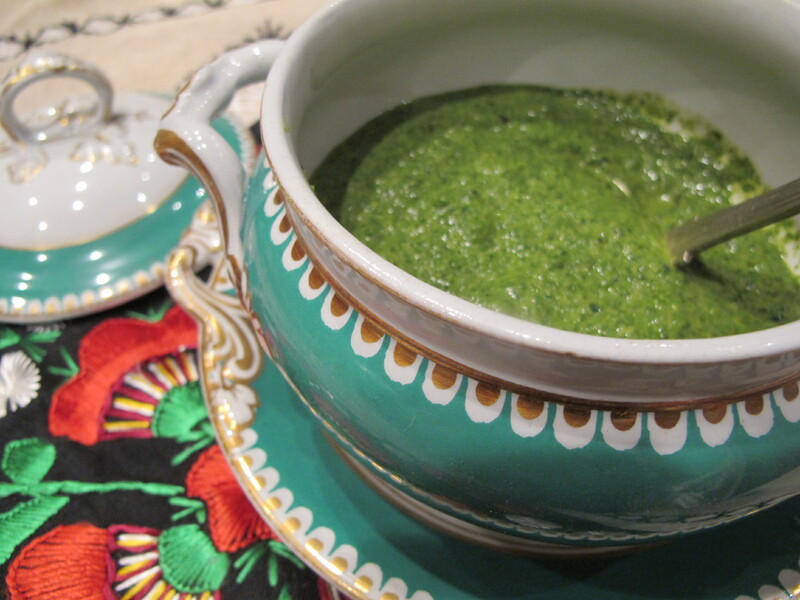 My brother’s and my favorite dish there, was creamed spinach. To this day we dream of it. 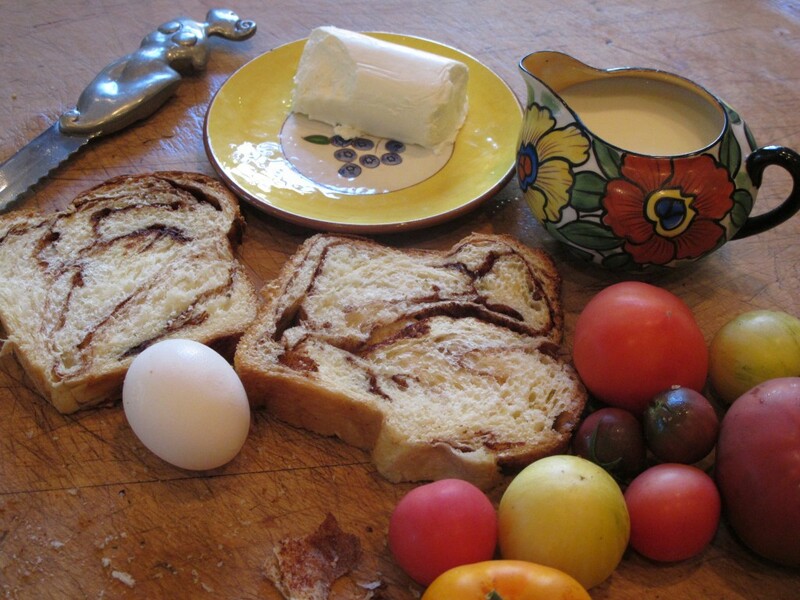 My Polish husband loves it and when I serve it to guests they remark on its deliciousness and ask how to make it. At a dinner party, where I served the dish, it was passed and around the table everybody took a polite portion. When it landed between myself and my Hungarian friend, Stephen Alix, I noticed we spent the whole evening eating more and more of it. There is a substitute for Mother’s milk! 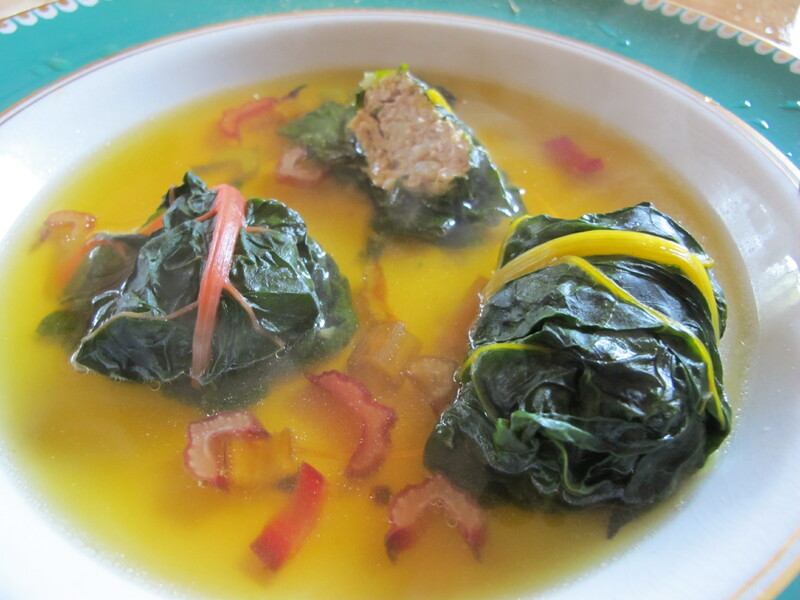 While the chard is cooling, make the sauce. Melt 1/4 lb unsalted butter in a saucepan. When it is melted add 3 tablespoons flour. Over a low heat, keep stirring until the butter and the flour have amalgamated. Add some grated nutmeg and a little salt to taste. 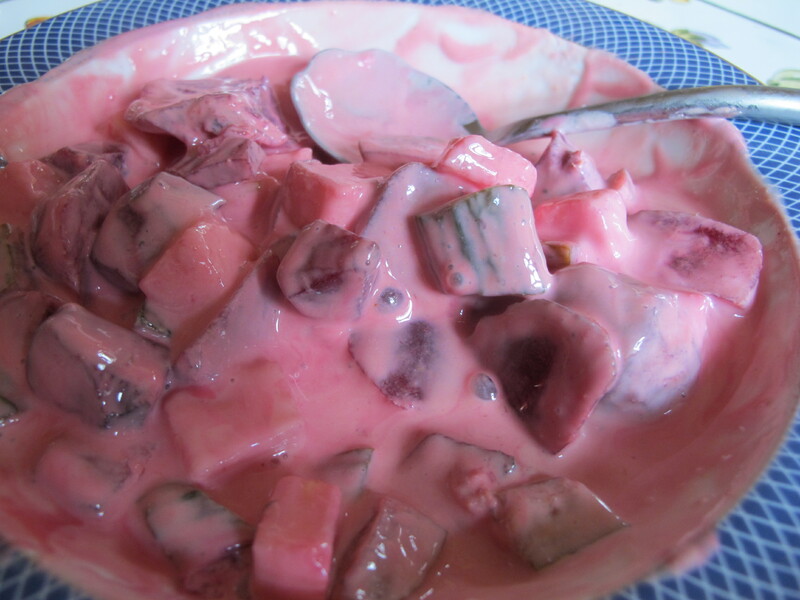 Slowly add 2 cups milk, stirring constantly until the sauce has thickened and is smooth. In this recipe, do not worry if the sauce has a few lumps in it as the blender will smooth them out. Cool. 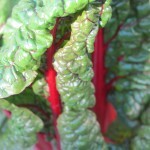 When both the sauce and the chard have cooled, puree in batches in a blender, adding cold milk as necessary. When blended, put the puree back in the pot and cook for about an hour, more or less, until all the textures and flavors are one. 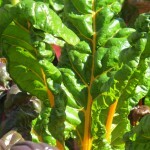 Serve immediately or the creamed chard can be refrigerated and reheated. 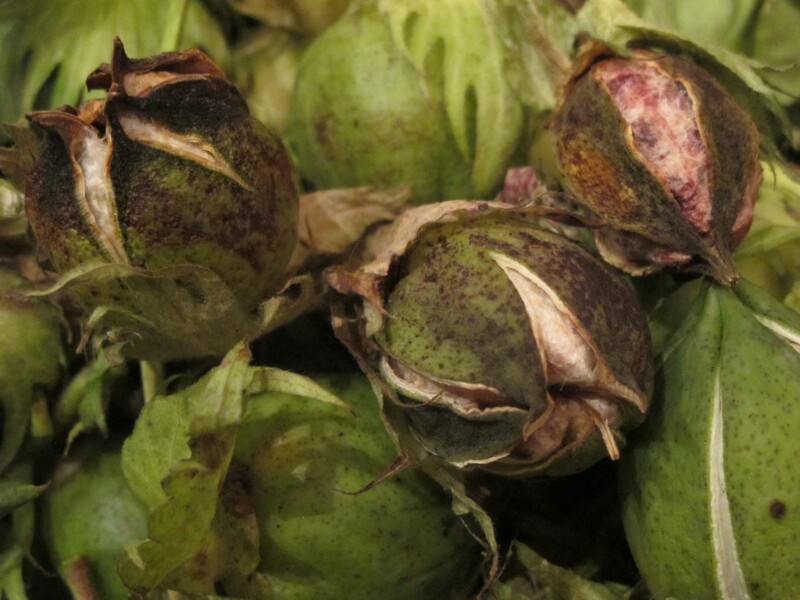 Growing impatient to see the bolls in my garden burst and ripen with cotton , I picked one today and opened it up to reveal it’s inner beauty. 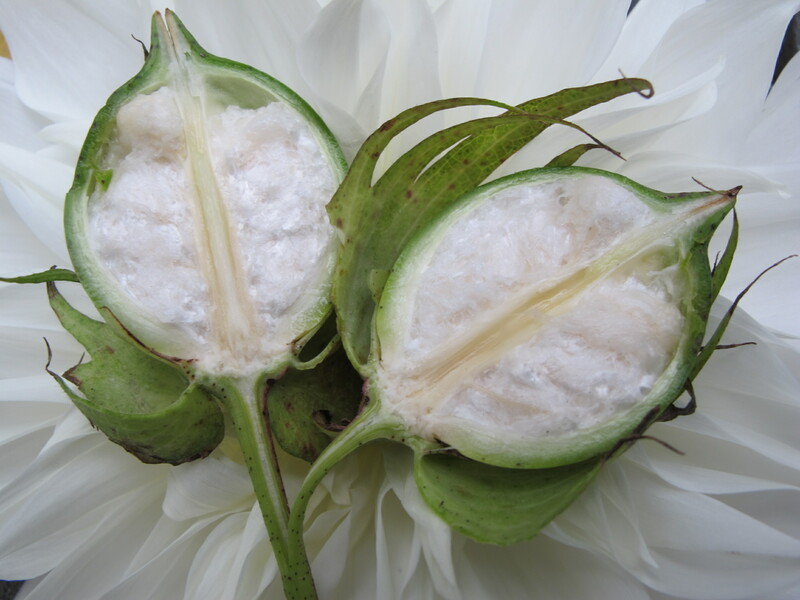 Here the developing cotton is placed on a late blooming dahlia. Breath taking! 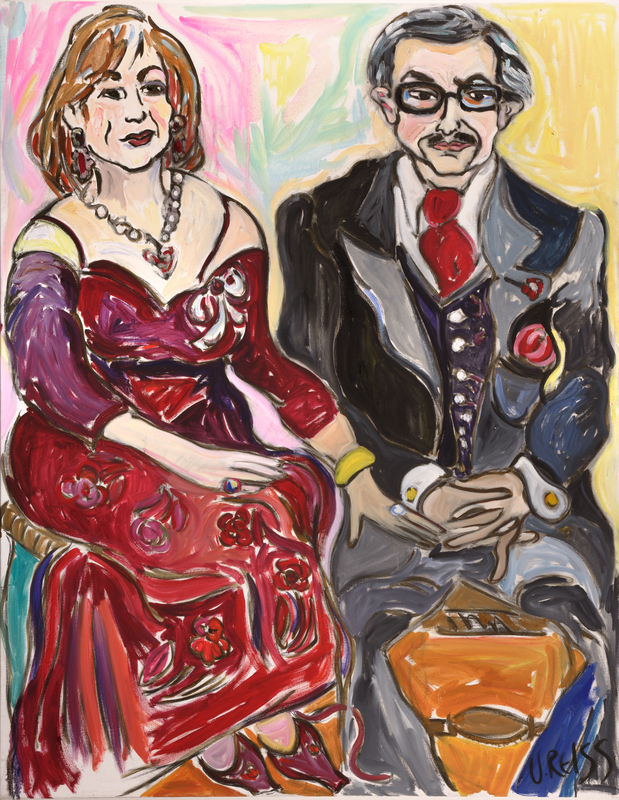 "Helen and George" oil on canvas 42"x 52"
" Helen and George "
The annual Vari’s garden party is always held in late August in honor of George’s birthday. I painted their portrait a few years ago in my studio in Toronto. When I paint a portrait, I usually ask the subject to bring an item that has significance for them. In this case they brought each other. This portrait, is a painting of Helen and George as individuals, but it is mostly about their relationship to each other . 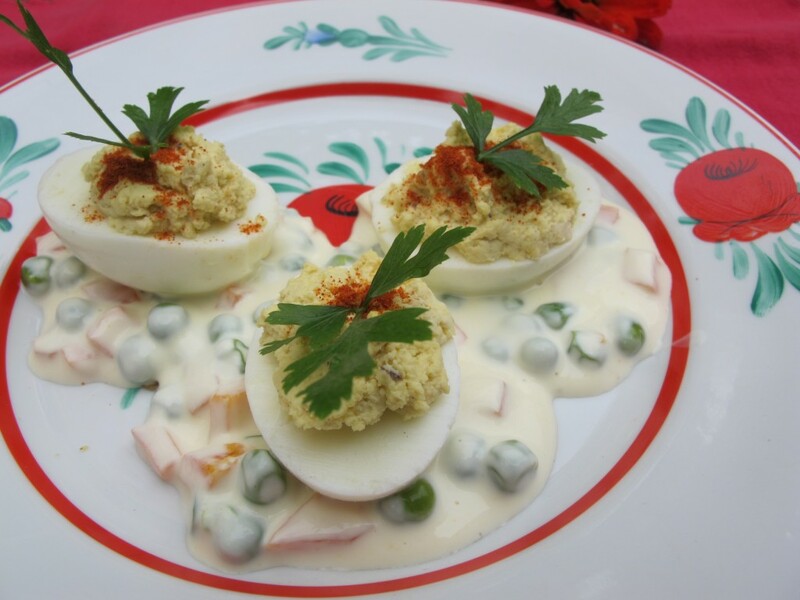 I always look forward to having “Casino Tojas” [deviled eggs] a food of my childhood at their party. My very glamorous mother, Marianne, made it for parties. So the festivities of childhood and ”Casino Tojas” are firmly entrenched in my taste buds as the happiness of childhood. The eggs: Hard boil eggs. When cooked, immediately plunge them in cold water. When they have cooled completely, peel and cut in half. Carefully take out the yolks and put them through a Moulinex [ a hand-held mini rotary grater] and let them fall into a mixing bowl. Blend well with mayonnaise, prepared mustard, anchovy paste, and ground black pepper to desired taste and texture. 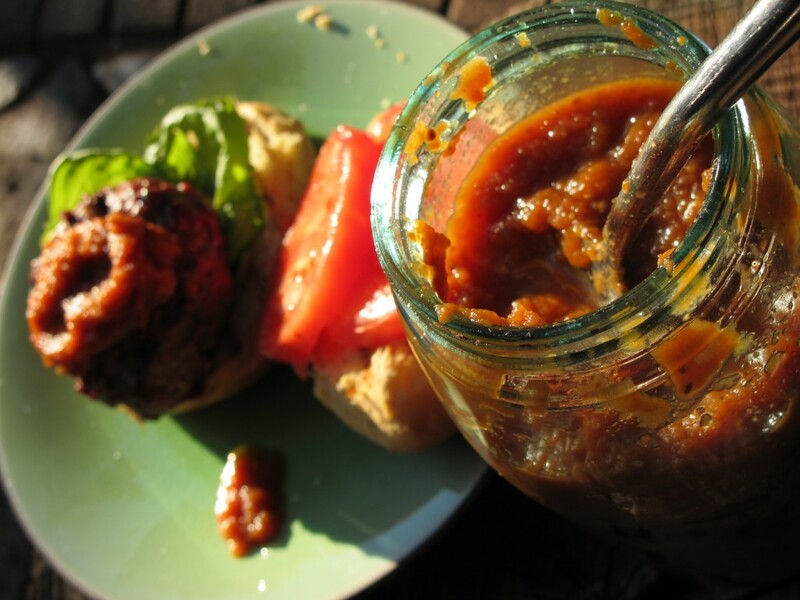 [Conserved anchovies and anchovy paste are in many Hungarian recipes. Their use, in the cuisine of a landlocked country must be a culinary throwback of the Roman occupation of Hungary and their fondness for garum, a fermented fish sauce.] When blended, mound into the halved egg whites and garnish with a sprinkling of paprika. Francia Salata:[ French Salad][ It says something about Hungarian's relationship to their vegetables that what I consider a sauce, they consider a salad. Anyway to me it's all about the sauce, which I sometimes serve at picnics with plain hard boiled eggs] Mix mayonnaise and sour cream. Slowly add prepared mustard and granulated sugar to taste. It’s all about the balance of sweet, sharp, vinegar and creamy. I never measure, but for the sake of the blog, I combined 1 cup sour cream, 3 tablespoons mayonnaise, 4 teaspoons sugar, and 3/4 of a teaspoon mustard. If you don’t like the flavor, you can always add more sour cream to soften it and then add the other flavors in proportions that please your palette. Add drained cooked diced carrots and peas. I used a cup for the preceding proportions. [My mother, uses drained canned peas and carrots, extracts the carrots and dices them finer.] Mix the salad gently but thoroughly and serve under the eggs. Pass extra salad, as desired. 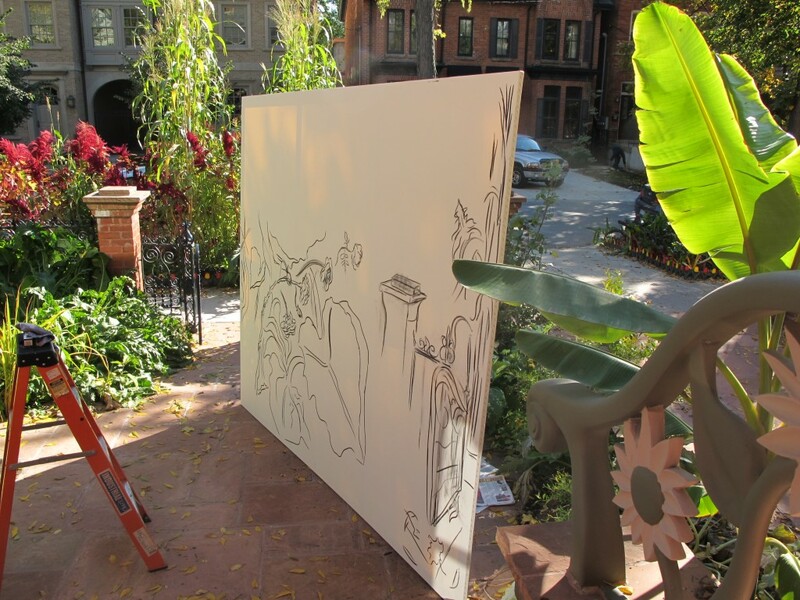 Most importantly, as a landscape painter, he taught me to get out and paint. Every day, I use the lessons he taught me. 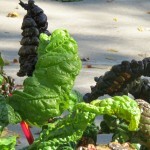 The large garden series that I starting this fall [ posted 9/20/2010], will be now dedicated to him. Thank you, Jason. 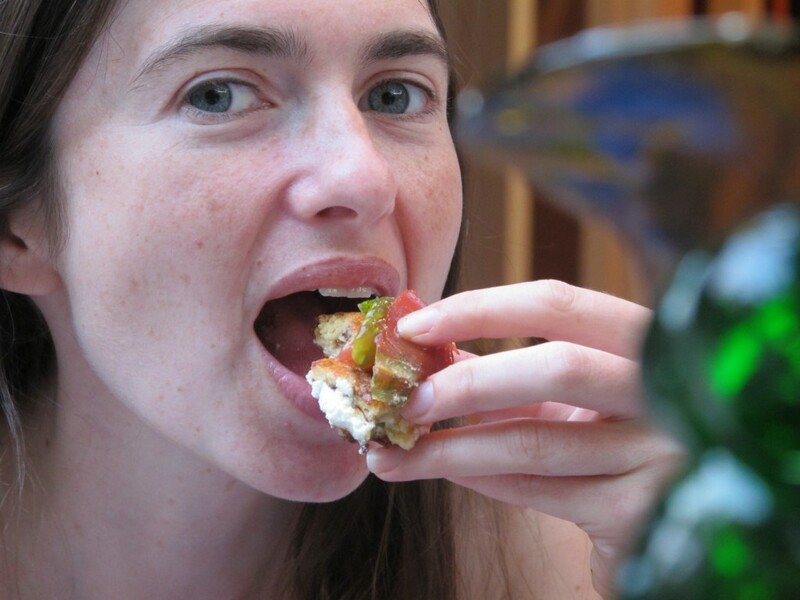 Several years ago I put on an event at my gallery www.vreissgallery.com called ” The Neuroscience of Molecular Gastronomy” http://video.google.ca/videosearch?q=%22neuroscience+of+Molecular%22&hl=en&sitesearch=# http://video.google.ca/videosearch?q=%22neuroscience+of+Molecular%22&hl=en&sitesearch=# It was a collaboration with my daughter, Ariel Garten ,who lectured about how we perceive taste and art through our senses and the history of molecular gastronomy. Surrounded by “Still life in motion, Portraits of food,” an exhibit of my food still lifes, I created and served a tasting menu to illustrate the points of the lecture. The format of the menu was color. Mostly, I played with perception. I watched chefs scribbling down notes, as I explained the premise behind my truffles. Truffles are chocolates meant to look like truffles, the fungi. I asked, what if the truffles were actually made with mushrooms and contained no sweeteners? I used a very earthy Ecuadorian 100% cocoa chocolate and Shitake mushrooms to create my truffles [Brown]. 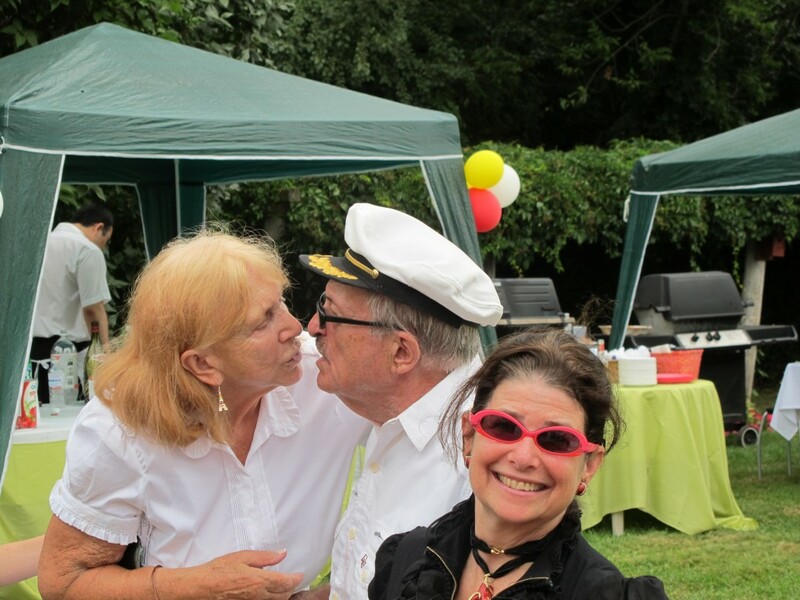 Because of the popularity of the event, we put it on to five different audiences. In a another play of perception, those audiences, that I told that the truffles were delicious to, were more likely to think they were delicious than to the audiences that I cautioned, may not like them. 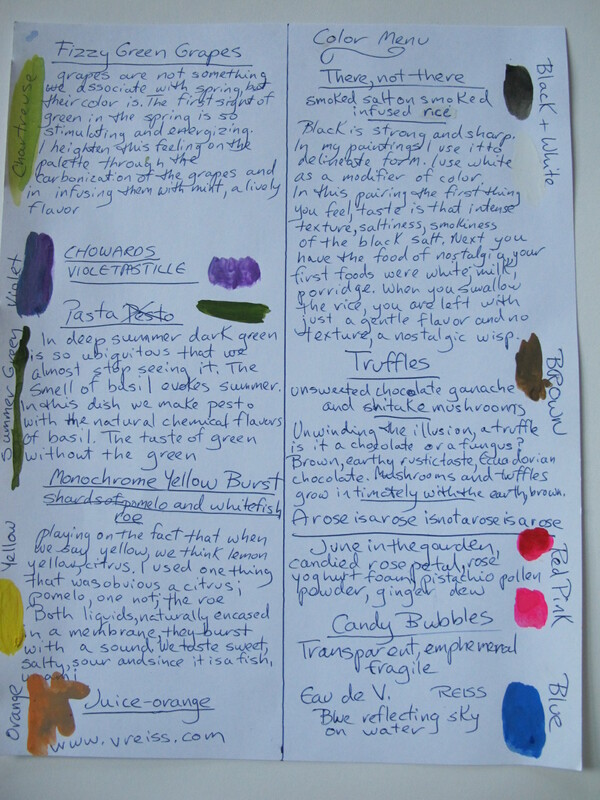 How do you explain our preconceived notions about color and taste? At home, I prepared two pitchers of orange juice, one with 5 drops of red food coloring and one without. Even though, just before drinking, I, myself had added the red food coloring and then of course knew about it, Ariel and I both thought the juice that was a redder orange, tasted sweeter! 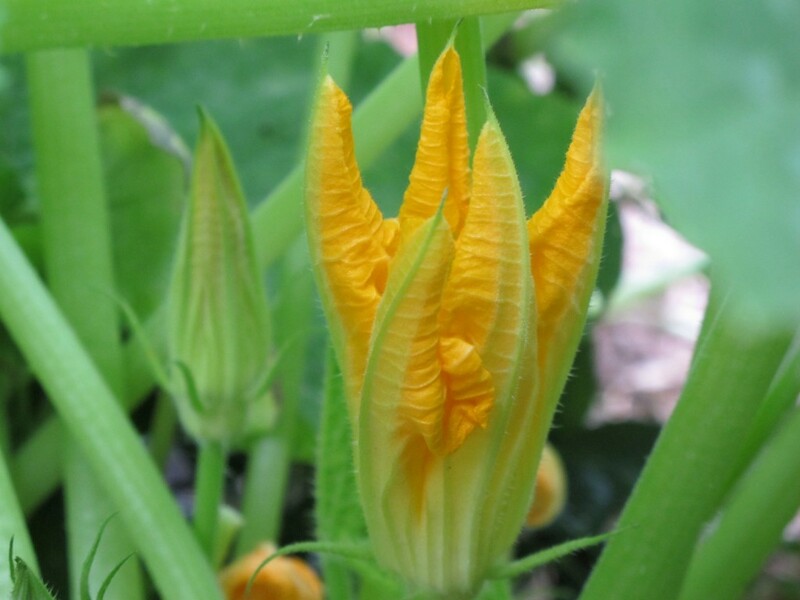 On September 9th, I published an entry about squash blossoms, “Summer Squash; Sunshine”. I thought, “Wouldn’t it be wonderful to emphasize the yellows of the recipe and the sunshine that yellow makes you think of ? It should have a surprise element, the yellow should be liquid and burst out of the blossom!” “Summer Squash: Liquid Sunshine” was created. 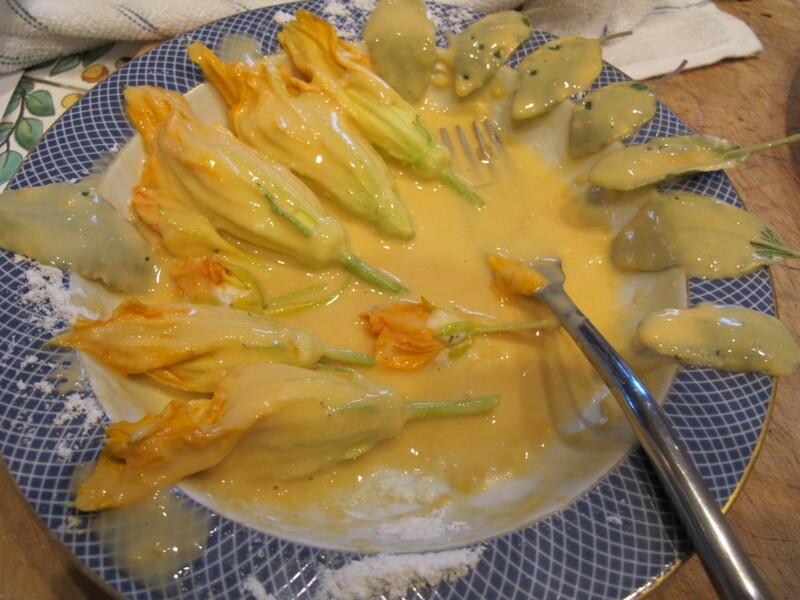 Recipe: Prepare the squash blossoms and the batter as per the directions in the recipe of September 9th. 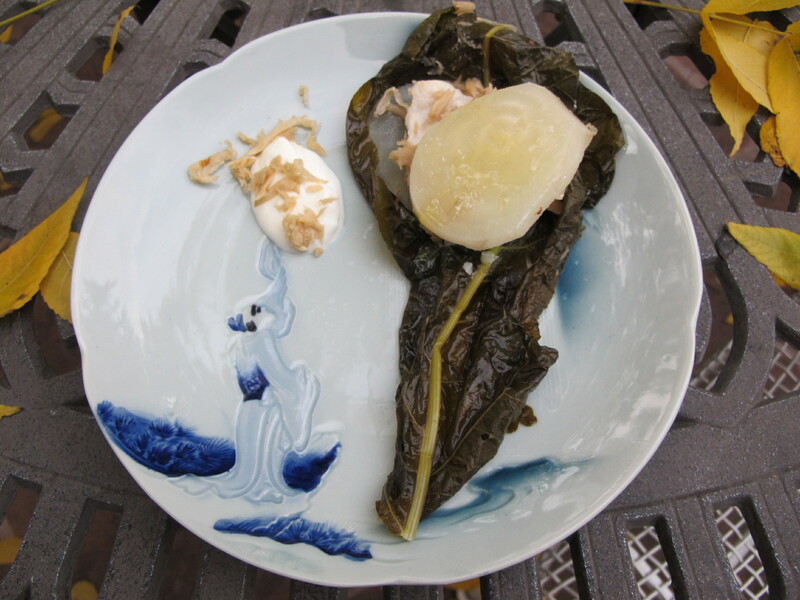 For each blossom, crack a quail’s egg into a cup. Hold the blossom open by holding it in one hand or placing in another demitasse cup. Gently pour the raw egg in to the blossom. 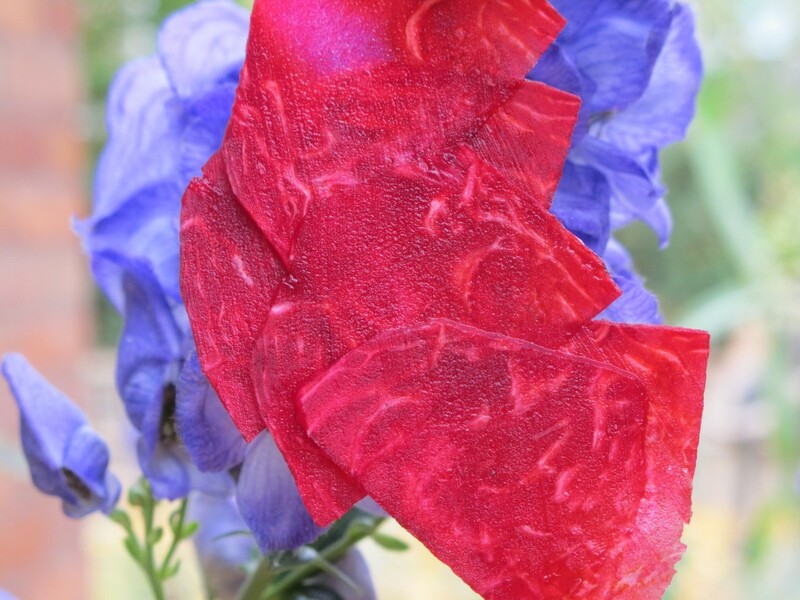 Twisting closed the top of the flower, coat with batter, holding it by the twisted top. Lower it carefully into a pan of hot oil and saute until the coating is brown. Serve immediately. Hopefully the yolk will still be runny when you cut into the blossom, but even if the yolk is set, it is still delicious. Make a few tests ones to get the correct timing of the dish. You will not mind eating the experiments! 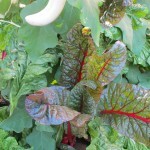 One of the most beautiful, healthy and delicious parts of my garden is my “front chard”. 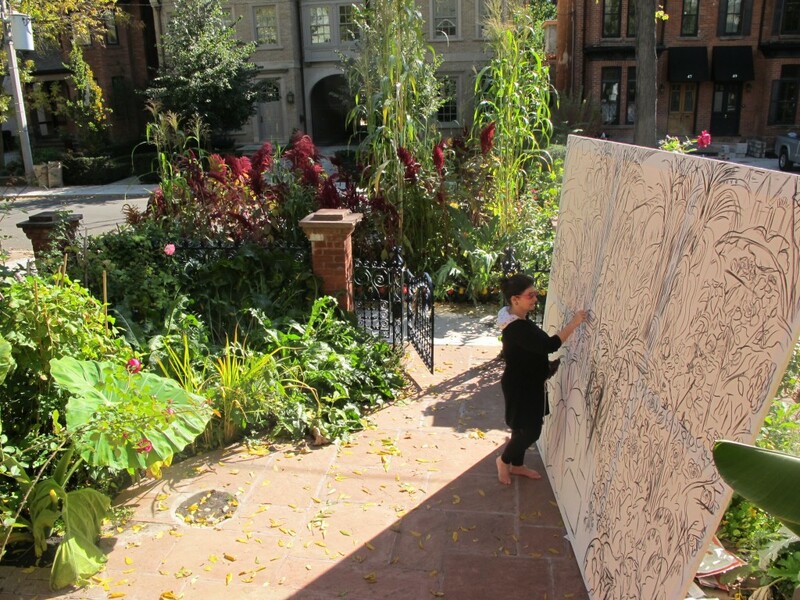 It grows between the sidewalk and the road on a patch about 140 square feet ,which is about the size of a large Tokyo apartment or a very small Florida walk-in closet. Well, you can’t live in it, but you can certainly live on it, as one of the larger 3 feet leaves could easily feed a family of four. Similarly, you couldn’t store your designer clothes in it but no Milanese couturier textile designer could come up with a fabric with such rich jewel like colors and a texture of beautiful ruching and semi transparency. When the shine shines through it, it looks like stained glass and water droplets look like sequins. Few walk down the street without stopping to admire it. 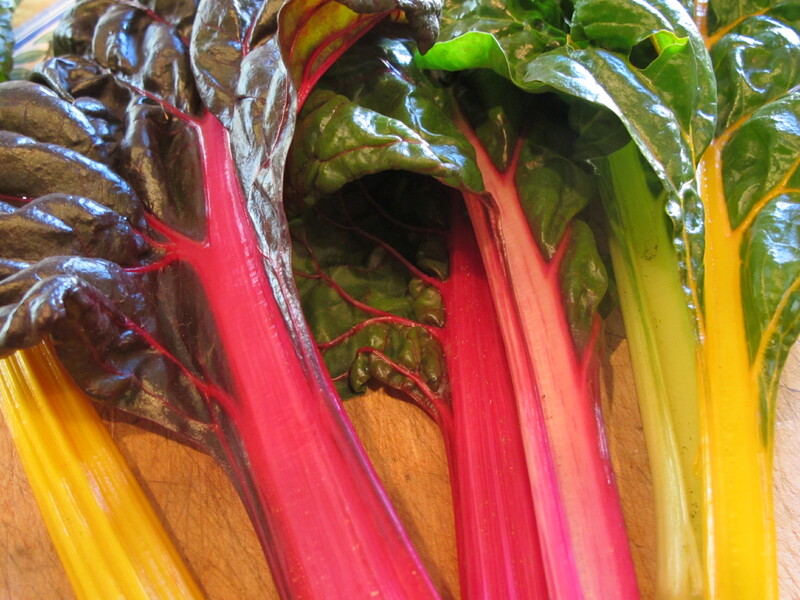 Most people ask if it is rhubarb but plantophiles know its real identity; Rainbow Chard. 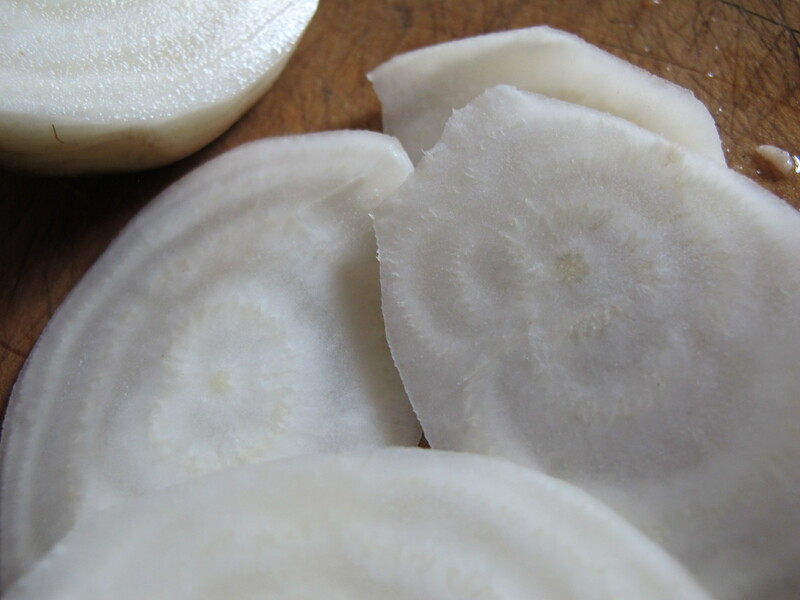 The first thing we harvest from our garden in the Spring is horseradish for our traditional Passover plate. We dig up the root ,wash and peel it and then don snorkeling gear to grate it. I usually accomplish this with a blender, adding vinegar as needed. Should you become cavalierly curious and stick your head in the blender jar to see how it is proceeding, even the mask and snorkel will not provide protection from its fumes and ensuing pain and tears. 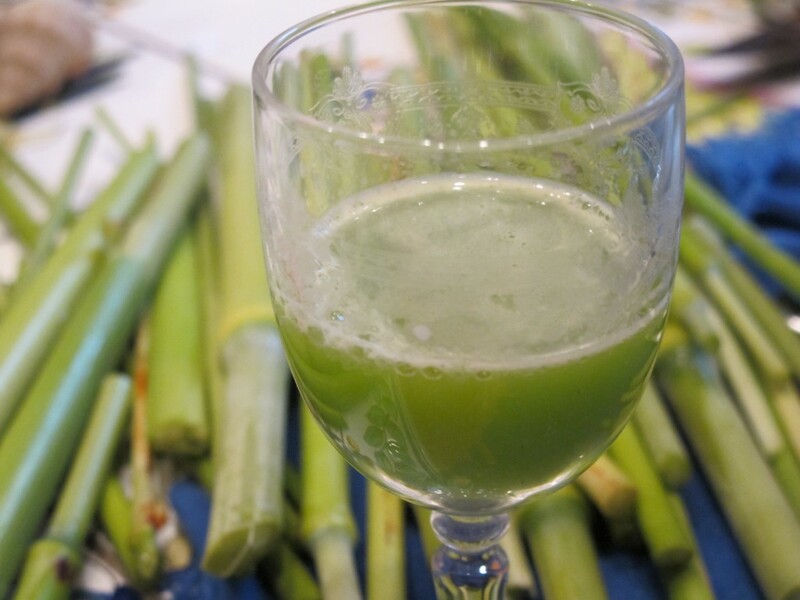 When it is passed around at the Seder, family and guests seem to take perverse pleasure, as they yelp in pain, of deciding if this year’s batch is hotter than the previous year’s. Many religions like to exploit a mantra invented by an 80′s aerobics instructor,” No pain, no gain”. Is this the symbolic meaning of the horseradish; to explain the hardships of life? As the meal is served, enthusiasm builds for the grated condiment. “Oh, it’s delicious on the boiled eggs.” “Oh, could we have some more for the gravlax and the gefilte fish?” ”Is there any more left to put on the matzoh balls?” Can it be that something that was initially painful has morphed into something delicious and pleasurable? 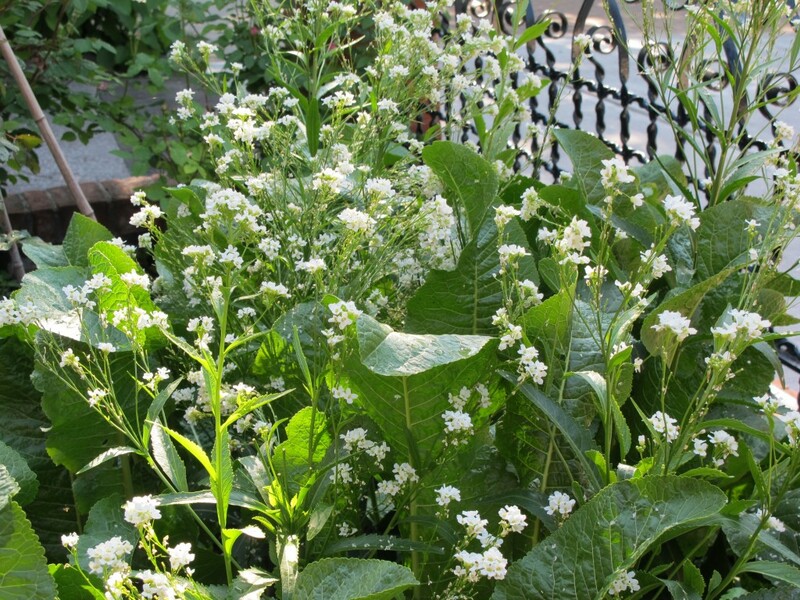 Back in the garden, if you dig up the horseradish, each little cut of its ever expanding root system provides a brand new plant of architecturally gorgeous leaves, until there is no room for anything else! Several years ago, I had had enough. I excavated the garden to a depth of 4 feet and put in new soil. It yielded a garden of beautiful soft fertile soil and guess what? A little bit of horseradish! Could the hidden meaning be that like horseradish, we are tenacious, even in the face of eradication? When several years ago when I was about to dig up the garden to eradicate the horseradish, Susur Lee http://www.susur.com/lee/ came by. 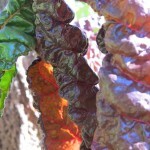 As I was lamenting the bounty, he suggested that he would try steaming and wrapping the leaves. I promised I would put them aside for him when I was about to dig the whole thing up. I put several large black plastic bags aside for him in the garage when that time came. 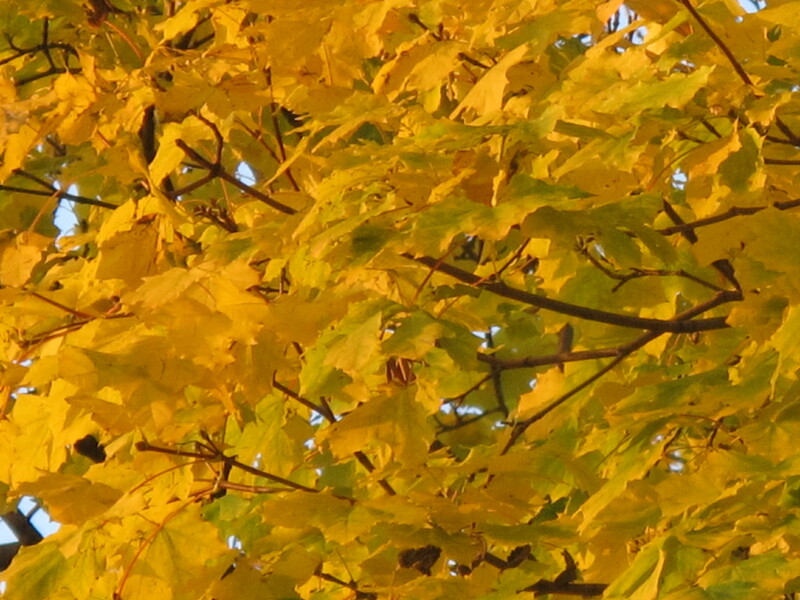 Before calling Susur, I asked my men ,”Where are the leaves?” ” Oh, those things? We threw them out!” Thus I missed my chance to provide fodder for the gustatory imagination of one of the world’s best chefs. 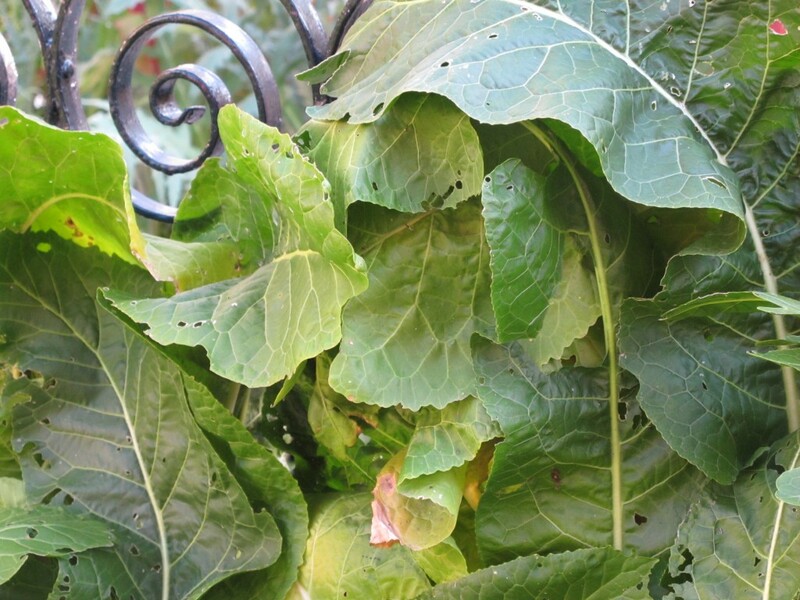 This Autunm, I was thinking that the time had come to curtail the growth of the horseradish again, so I had no reservations about digging and poking around the roots.Thus inspired by the idea of steaming the leaves, my original recipe was born. 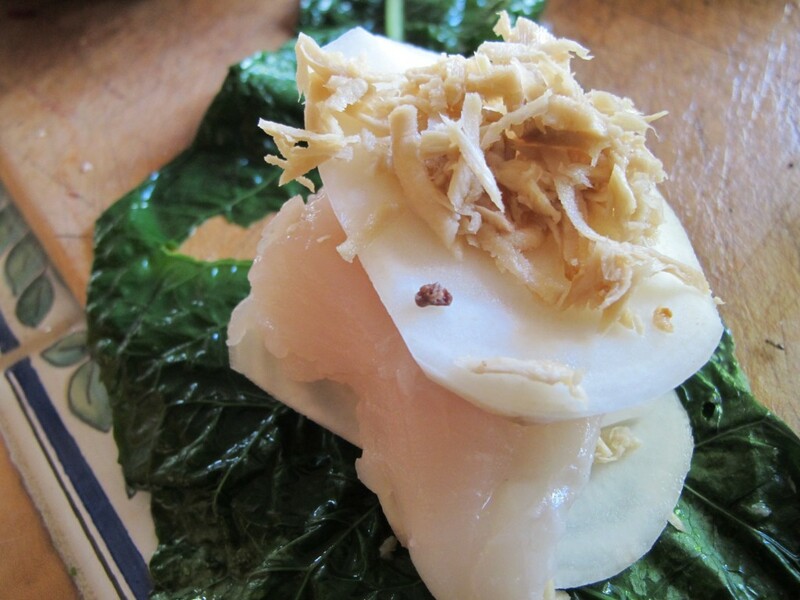 For each serving you will need : 1 horseradish leaf , a 3″ x 3″ square of halibut, several slices of “Albino”beet, and grated horseradish root. 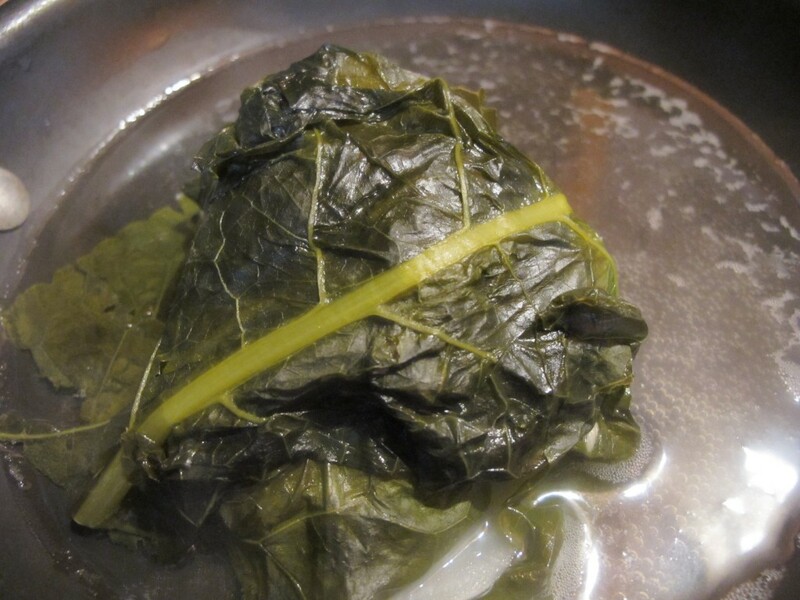 Briefly steam the leaf until pliable. 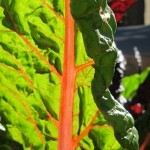 When the leaf has cooled spread it out and make layers of beet, fish , root, beet, root. Fold the sides of the leaf around the package and then complete the wrapping by rolling the package from leaf end to end. Place about an inch of Riesling wine in a small sauce pan. Bring to a simmer and then gently place the package in the wine. Cover and gently simmer for about 20 minutes. To serve, unwrap the package on the plate it is to be served on. Open and drizzle a little olive oil on the exposed beet and serve with a dollop of sour cream topped with a bit of grated horseradish. I served it to my husband and ran to do some errands. When I came back I asked him how he liked it. He said that it was over the top delicious except he wasn’t crazy about the Japanese tasting thing. The leaf ! I had meant it as a flavoring and to keep the fish moist . 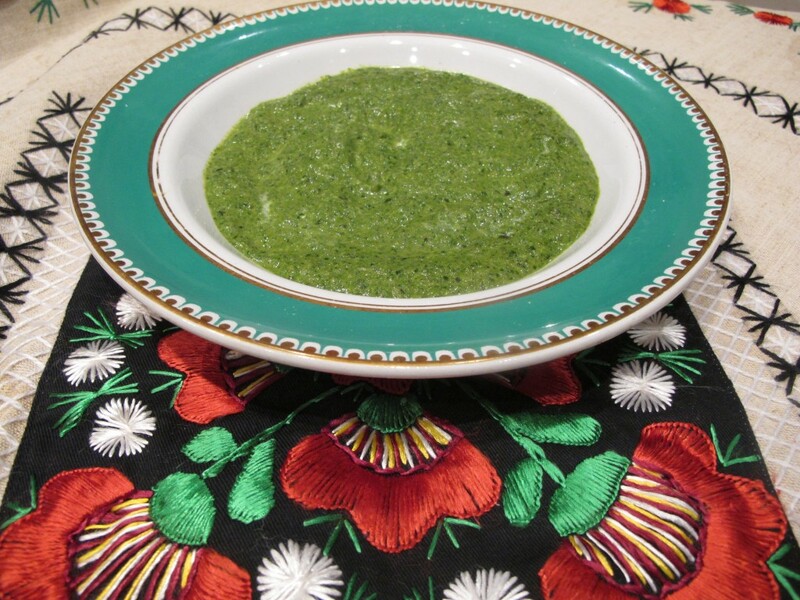 I have eaten the flowers of the horseradish and munched on the raw leaves and now we know that dependant on the degree of exoticism you enjoy in your foods that the steamed leaves can be delicious too! At the Rivoli, for the Sunday night Laugh Sabbath event that was supposed to be hosted by Kathleen Phillips, I found a woman on stage named Brenda Carhart-Carmichael. This one reveals me as one hot tomato Mama! If Toronto is looking for ways to generate revenue, we need to position speed traps near Josh Josephson’s house. Because when he shows up for dinner, having forgotten wine, he rushes from Chinatown to Rosedale and back in the time it takes me to heat up soup. In the third quarter of July, I noticed a little empty space in the garden leading to the house. It was a stubborn piece of earth. In that spot, I had tried several times to germinate watermelon seeds and seeds from particularly delicious melons I had just consumed. Nothing grew. That tempting piece of earth did not seem fecund. I bought a packet of “Cocozelle Squash” described as, “a striped Italian beauty; the race car of the vegetable garden.” And fast it had better be, as it was late in the growing season. 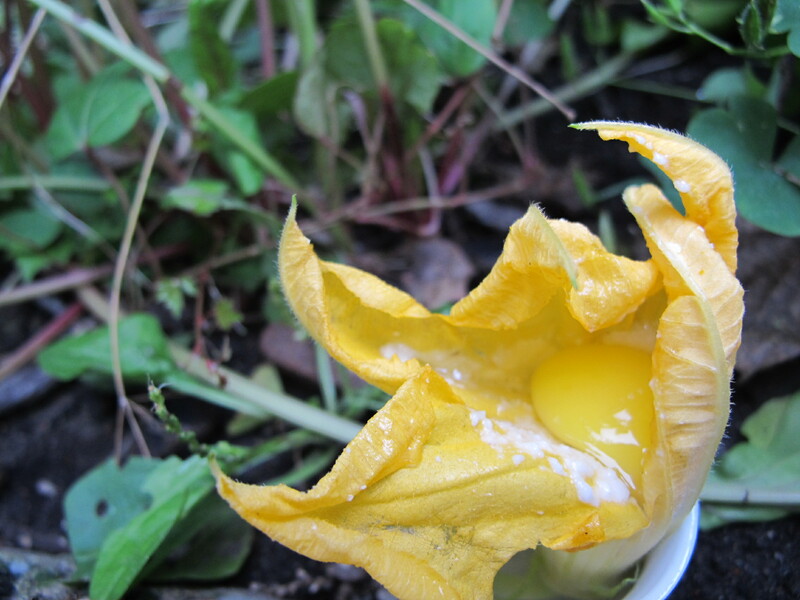 I was hoping not so much for squash, as for blossoms to stuff, batter and fry. I planted several seeds on the spot. Today, I stepped out the front door and noticed that space, once barren, was filled with leaves, yellow squash blossoms and even a small yellow squash. 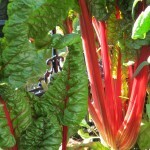 It was time to celebrate the hot sunshine of this Summer, which had allowed this crop to grow in such a short time. 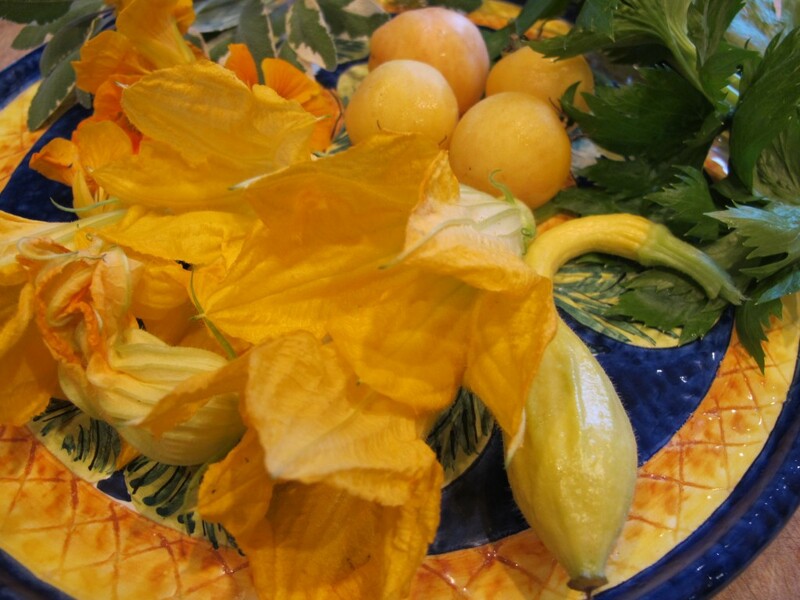 I gathered the squash blossoms, the tiny squash, variegated sage leaves, yellow nasturtiums and “Wapiscon Peach” tomatoes; named for their yellow fuzzy skins, from my garden. First make the batter: Beat one egg, adding a grating of nutmeg and salt to taste. Mix in 1 tbs. flour and 1 tbs. of water. Mix until incorporated. 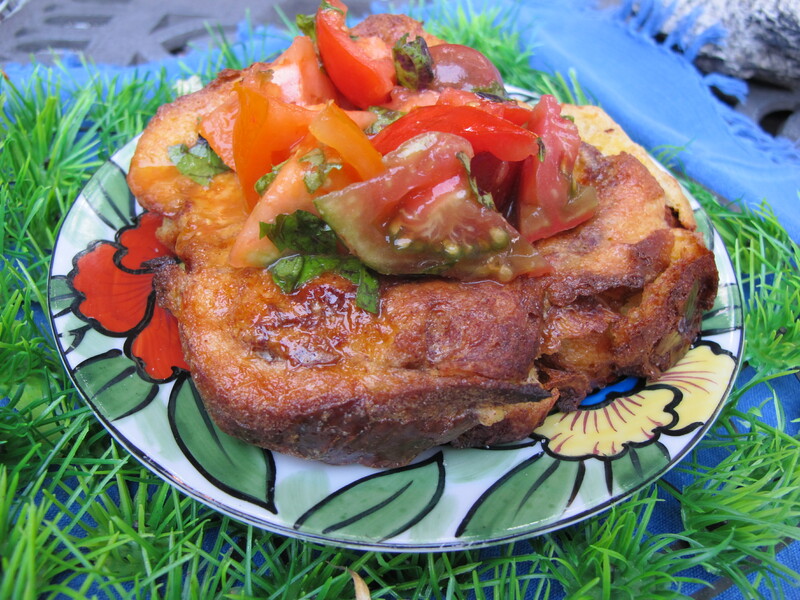 This will make an eggy batter in keeping with the sunshine theme of this dish, but you could use any batter recipe. I have also used tempura batter mix to coat and fry all manner of herb leaves for an easy appetizer. 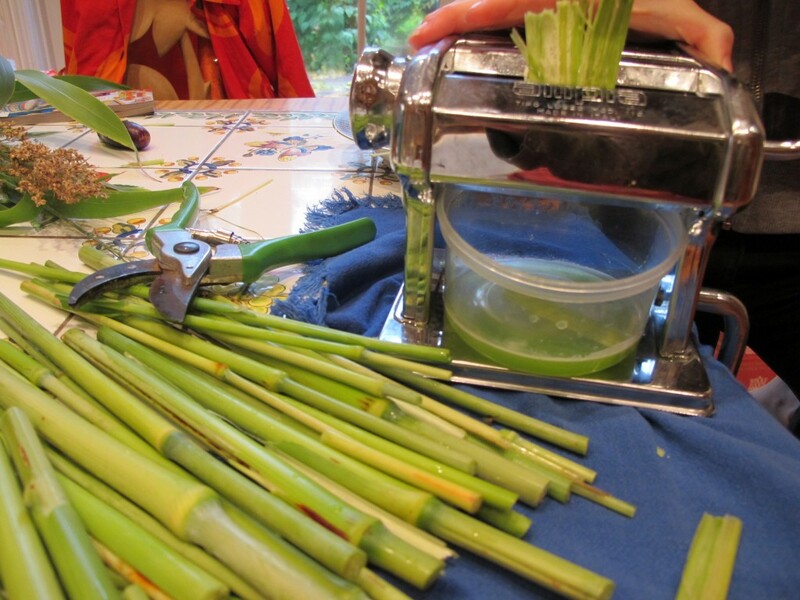 Prepare vegetables: Remove the piston from the blossoms and check to see that there are no pollinating insects within. Slice the squash into 1/8 inch rounds. 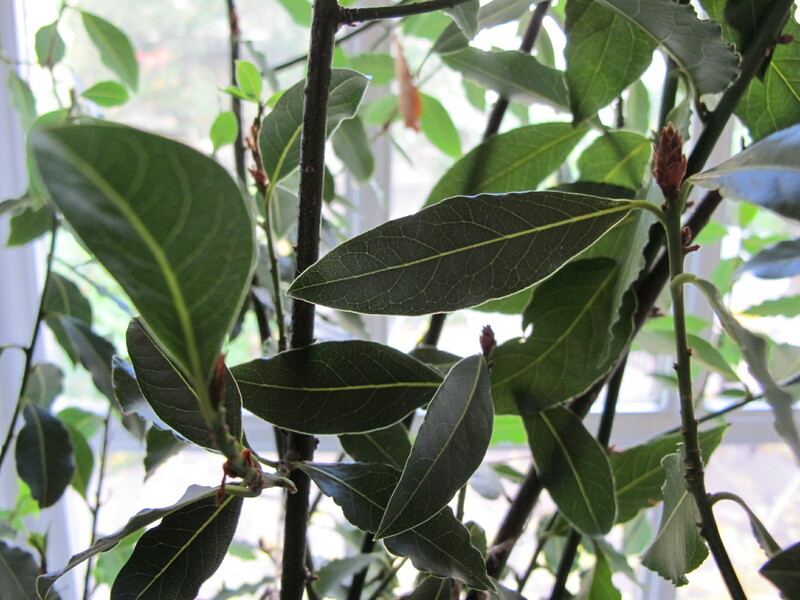 Detach sage leaves from their branch. 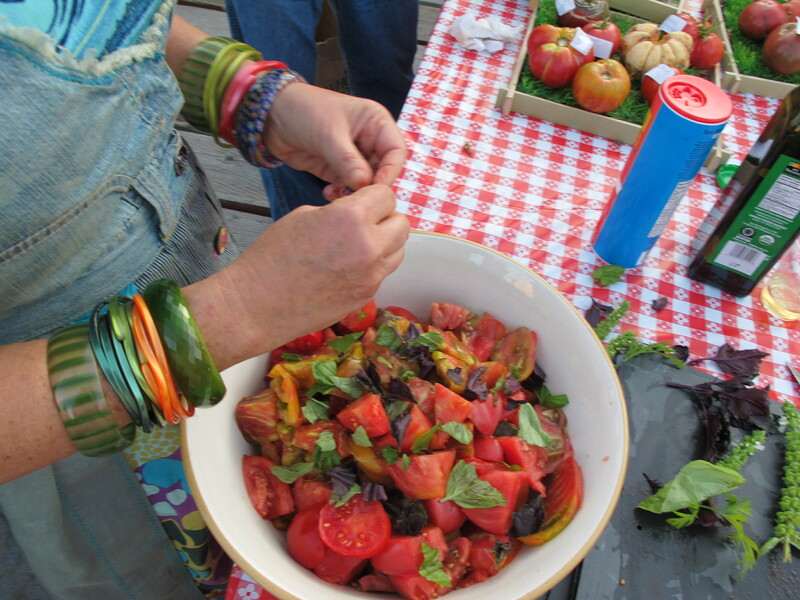 Slice half the tomatoes into 1/4 inch rounds and dice the others for a salad garnish. Filling and battering the vegetables: In a small bowl, put enough ricotta cheese to stuff the blossoms, adding lots of freshly ground pepper. 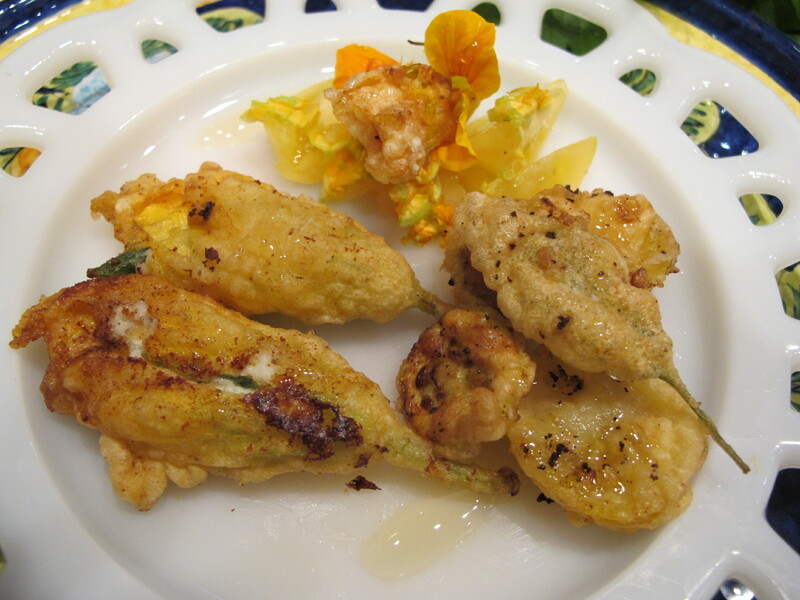 Open the squash blossoms gently and place enough ricotta to come up to where the petals begin to separate. 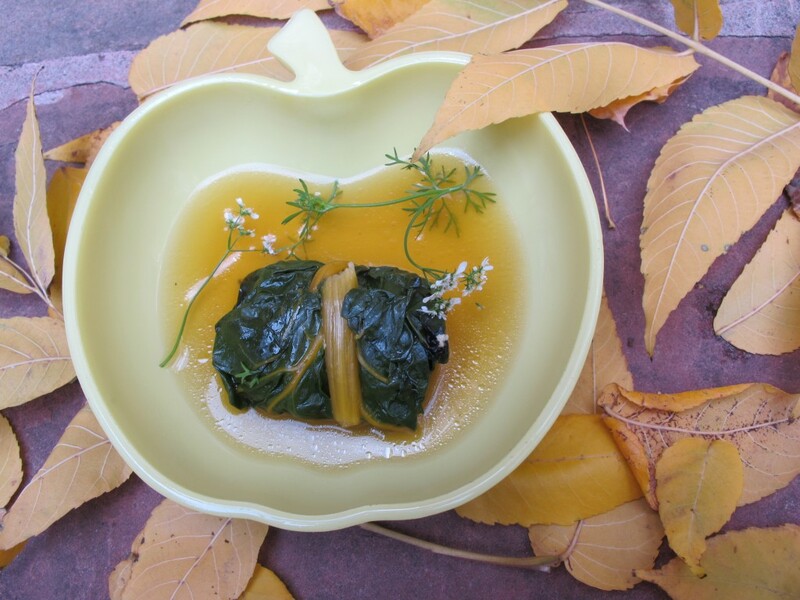 Gently push into the ricotta-filled blossom one sage leaf . 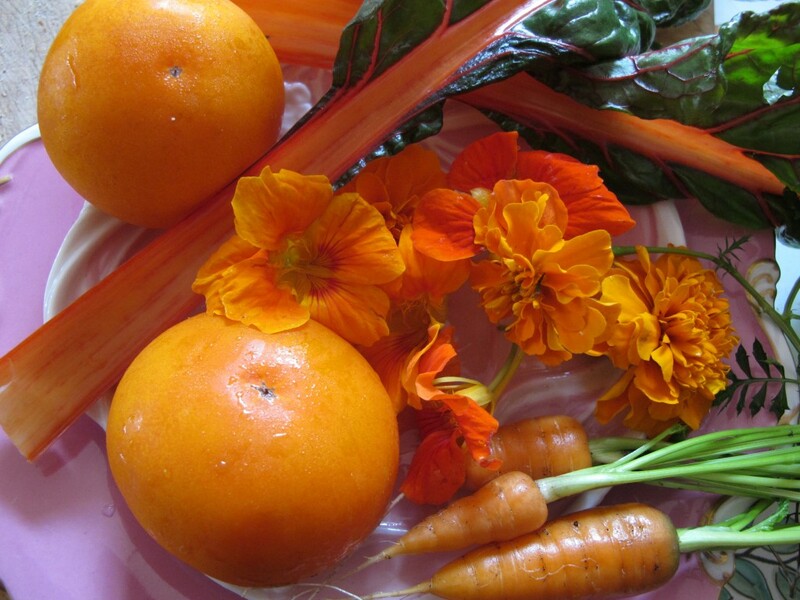 Repeat with the nasturtiums reserving several flowers and squash blossoms for garnish. 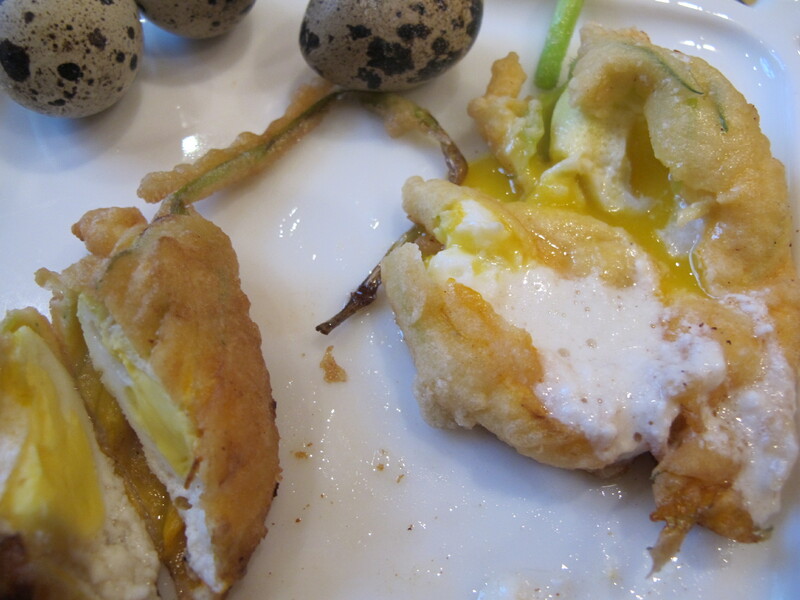 Battering and frying: Coat the cheese-filled flowers, squash rounds, sage leaves, and tomato rounds with the batter. 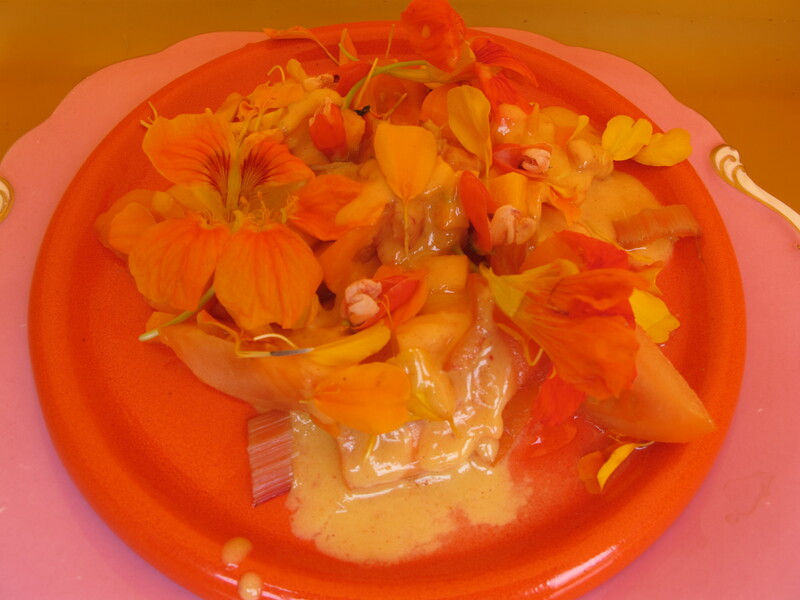 The blossoms tops should be gently twisted while battering to seal in the cheese. The tomato rounds should be lightly dusted with flour before dipping in the batter. Frying and preparing the garnish: Heat about 3/4 of an inch of oil in a frying pan. When hot place the battered ingredients in the oil. Fry, turning occassionally, until golden. I find using chopsticks, to place and turn, is best on such small items. As the pieces are ready, drain on a paper towel. Prepare garnish by chopping the reserved tomatoes and slicing the squash blossoms into shreds. Toss with a little olive oil and salt. Assembly: In one corner of an individual serving plate heap some tomato salad. 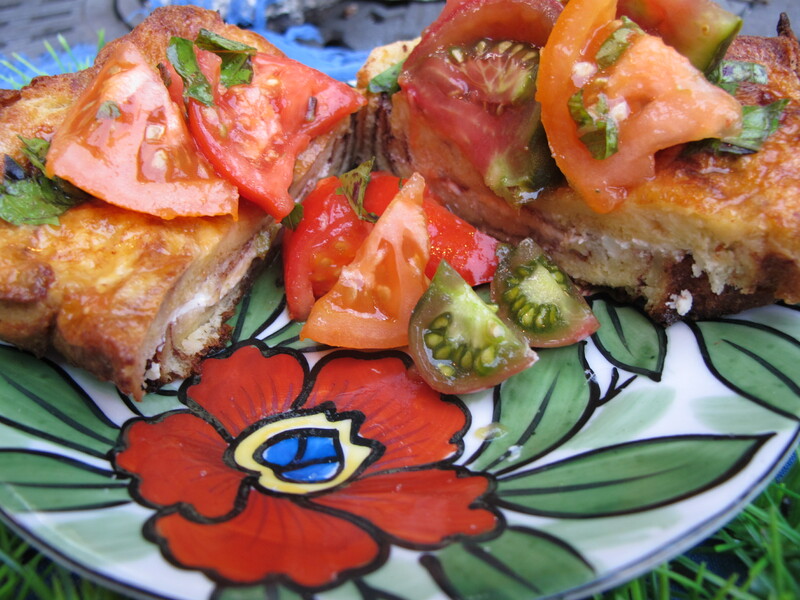 On top of the salad, place one fried nasturtium placed inside one raw one. Place the stuffed fried blossoms, both squash and nasturtium, fried tomato and squash rounds on the plate in a pleasing pattern. Drizzle golden honey over all the ingredients and serve. The rays of the late afternoon sun are lengthening and what seemed impossible two months earlier is now a reality; there are too many tomatoes to eat and too little time to enjoy them. There has to be a way to catch up with the bounty and savor them now, and later. The solution is to make my annual ketchup. 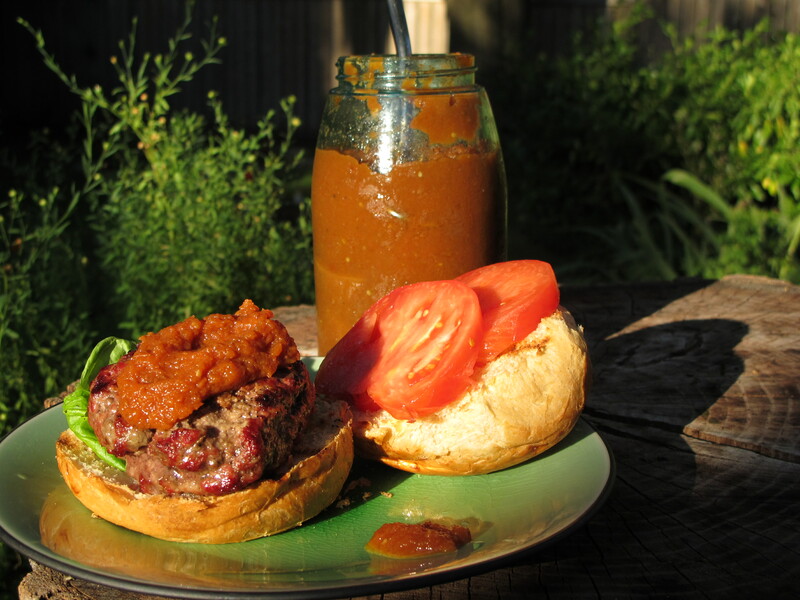 Be warned: The last time I gave some of this ketchup to my dear friend, Fides Krucker [sometimes known as "The Nursing Diva"], she said that every night, she had to have a hamburger for dinner until the ketchup was gone. You, will also find that the burger is just a vehicle to heap the ketchup on. Simmer for approximately one hour until thick. Cooking time will vary according to the type and juiciness of the tomatoes. You can also at the end of the 1 hour, leave the pot of ketchup at room temperature overnight and thicken in the morning by simmering again; a trick that is valuable for many kinds of jams, sauces and chutneys. 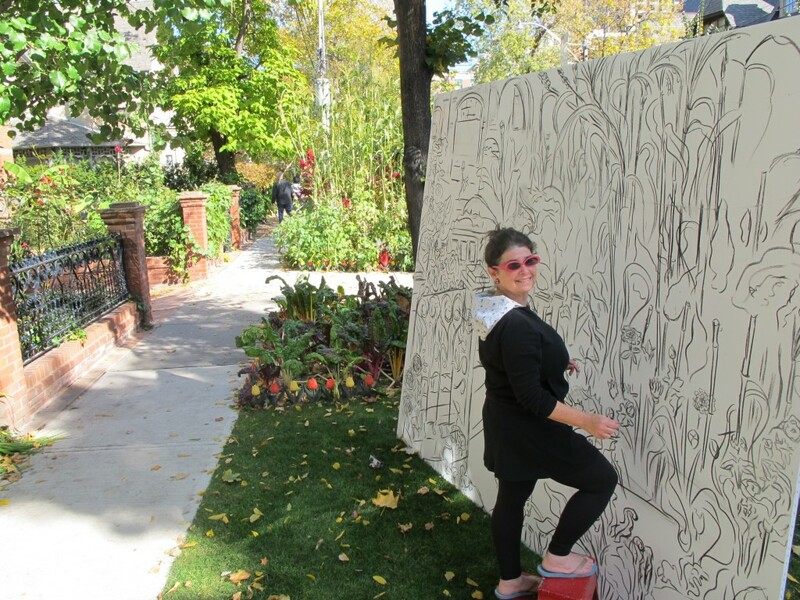 On a tree-lined street in the Annex, passersby are struck by giant corn stalks, just part of a whimsical, colourful garden that’s the brainchild of artist Vivian Reiss. 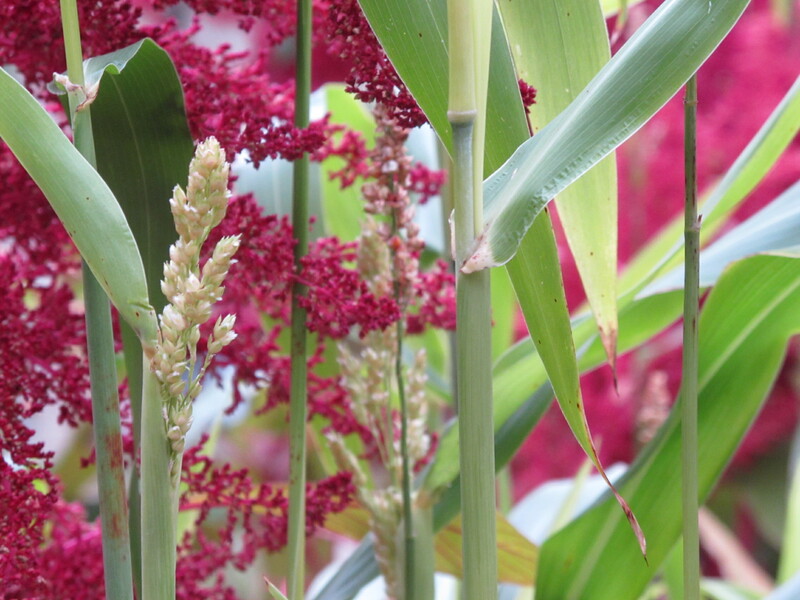 In the post of August 29th, I was struggling to measure the broom corn with a ten foot pole. I needed a fifteen foot pole to touch the tops of the corn. 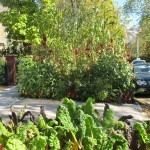 In this photo if you look at the tiny sprouts at the extreme left you will see the broom corn in my garden in June. To the right of them, there are the Zinnias and after that, the cotton. 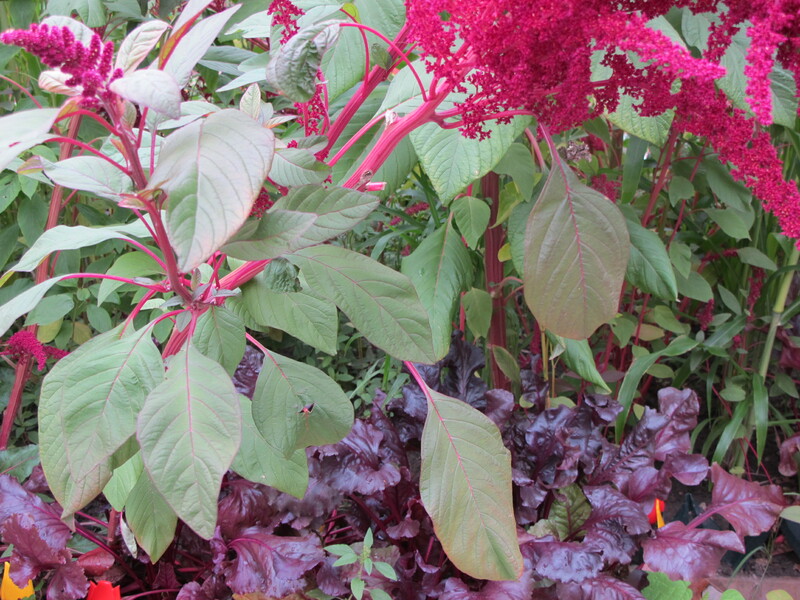 What a miracle of love, sun, Summer, water and nutrition has made my garden grow so tall and lush. Like clockwork, a year to the day, since our last year’s tomato tasting, Corey Mintz shows up at my door to borrow a cup of tomatoes. He was bearing my ORANGE! Kozial shopping basket. I had missed it so badly, a year is along time to pine for a shopping basket, that I decided to celebrate its return with an orange salad from my garden. ”Caro Rich” a true orange tomato, hung tantalizingly ripe in my garden. It was an obvious first choice. Foraging in the garden , I came to my peace sign-shaped marigold bed. 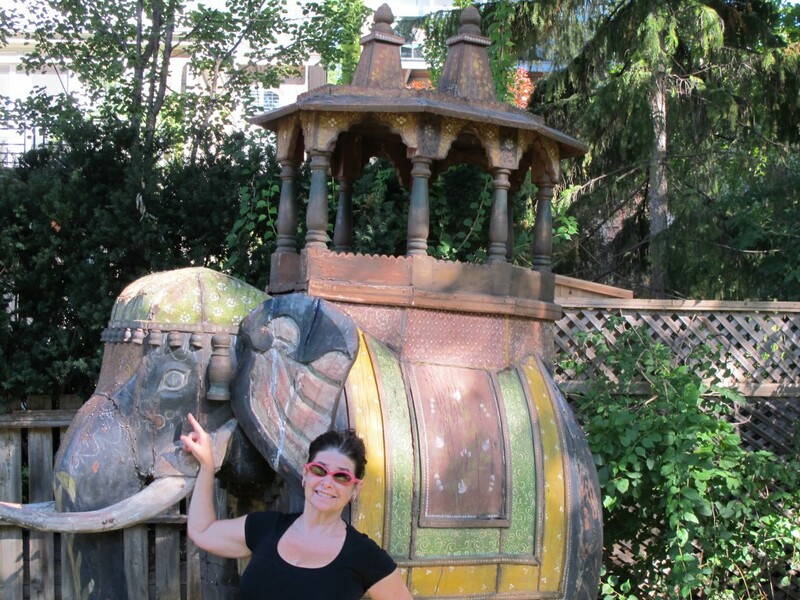 I picked the marigolds that I had planted in my textile garden to keep my giant teak elephant from Rajasthan company. In the front yard I have two ancient pots holding tomatoes and under them I had planted carrots from seed. I have heavy clay soil in my garden and despite many years of soil amendment, carrots will only grow in a pot. Nasturtiums trail up my front walk. I picked the orange ones. 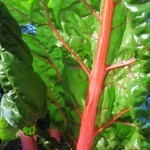 Out onto the boulevard and my Swiss chard. I found some leaves with orange stems and picked those. Now for the dressing, Saffron? Commonly lauded as yellow ,the saffron that a friend brought me was definitely orange. I prepared the dressing by putting a pinch of saffron in a blender, adding a small spoon of dijon mustard, a dollop of honey, a peeled peach [pastel orange] and salt to taste. Blend until smooth. taste and adjust adding little lemon juice if you think it needs it. 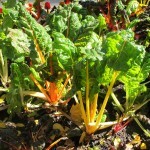 Thinly slice the stem of the chard, use the leaves in another dish. Place in small pan, appropriately I have an orange one, but any color will do and will not effect the taste. 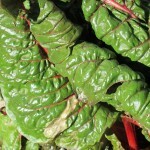 When the chard is boiling , drain and refresh under cold water. The tenants that hadn’t made it to the tasting were delighted.